You may use the navigation menu to the left to browse the picture gallery. To submit a photo, use the form found in the Submit option. This is the first 2 slot I consolized. It was unreal as to how easy it is to consolize compared to an MV1C in an enclosure. This is my CMVS woody. 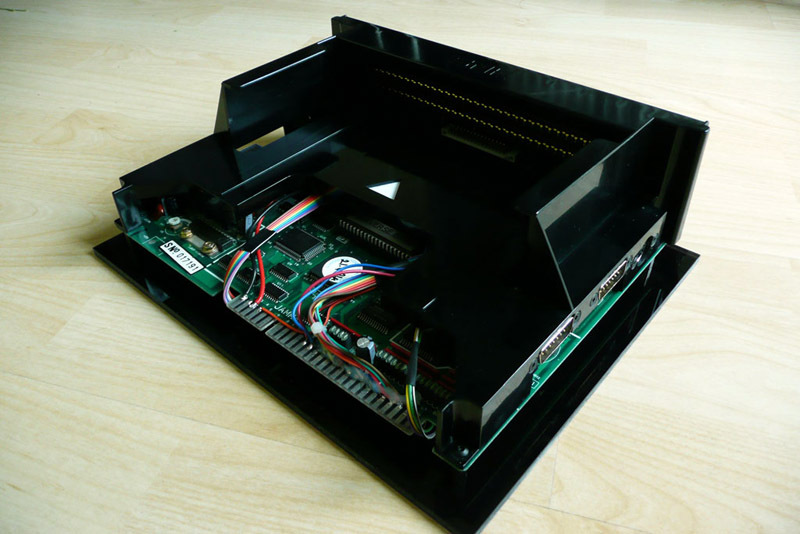 Enclosure was built by DanUK on the neo-geo.com forums. This is by far my favorite to date. 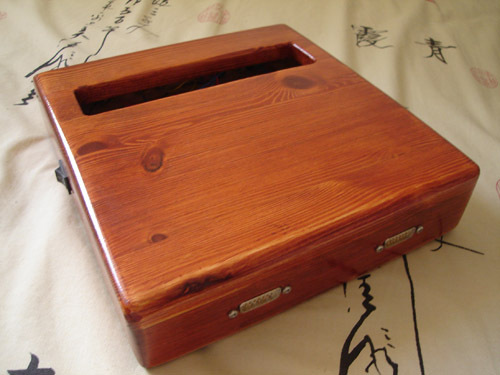 Mostly for the look of natural wood and it was so sturdy and had a nice weight to it. Taking out carts and putting them in was a breeze. 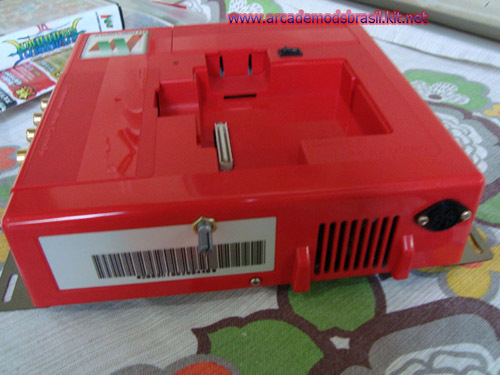 This is the back shot of the Woody. 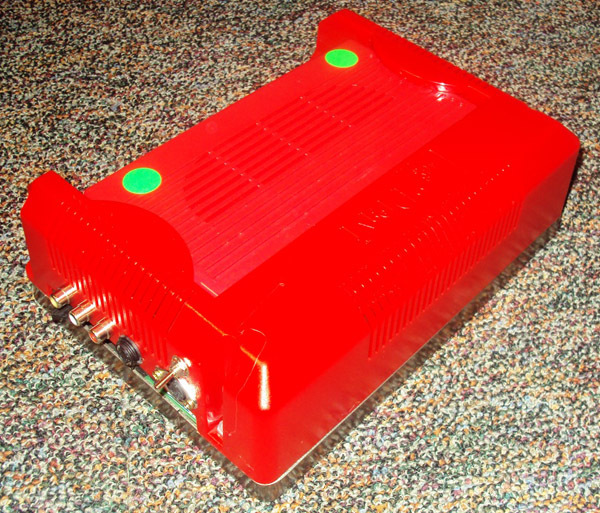 The CMVS cover is a custom one made by Terry at Co-Du-Co dust covers in Texas. This is the front side shot of the Woody. 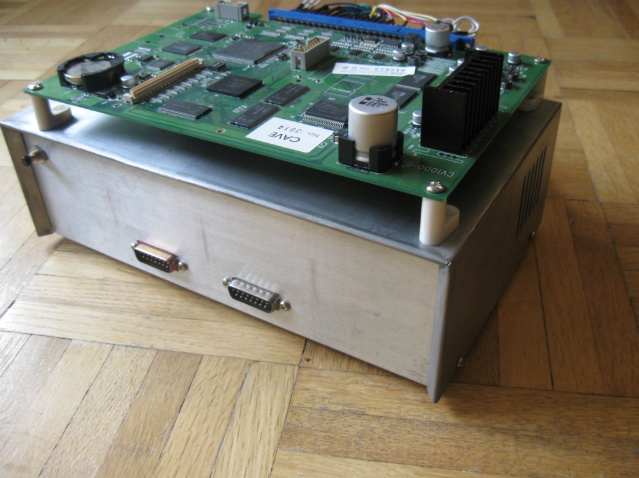 This is the first CMVS I built. 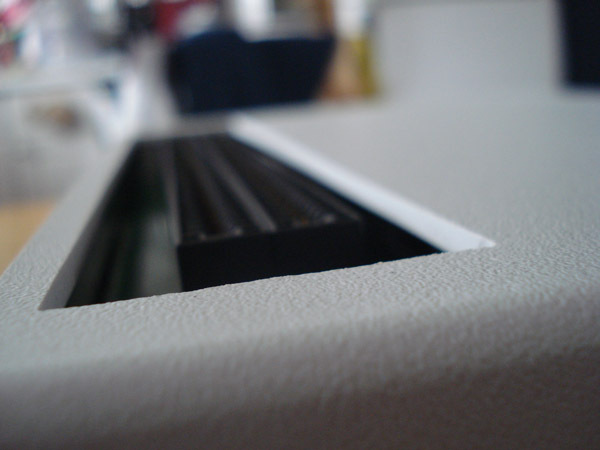 The enclosure is made of extruded aluminum and is available from Hammond Manufacturing. 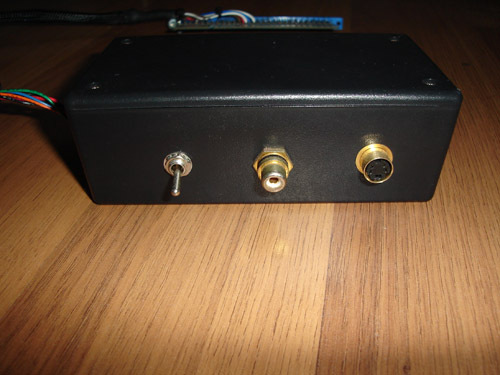 Very small enclosure and a nice tight fit for the MV1C board inside. 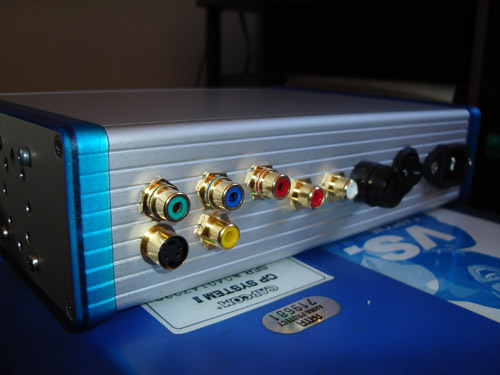 Back shot of the video and audio jacks. This is my Alien CMVS. 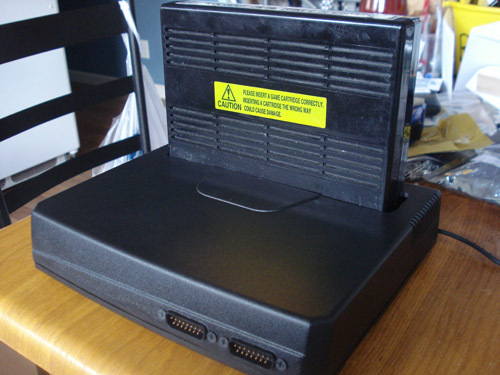 It is an MV1C housed in a molded Neo Geo CD top loader enclosure. I used Bondo to smooth out the lid and curves. 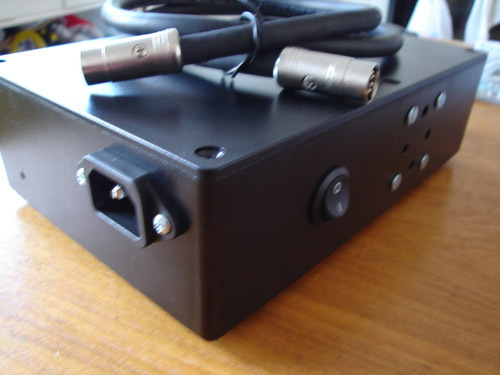 Back shot of the video and audio jacks. 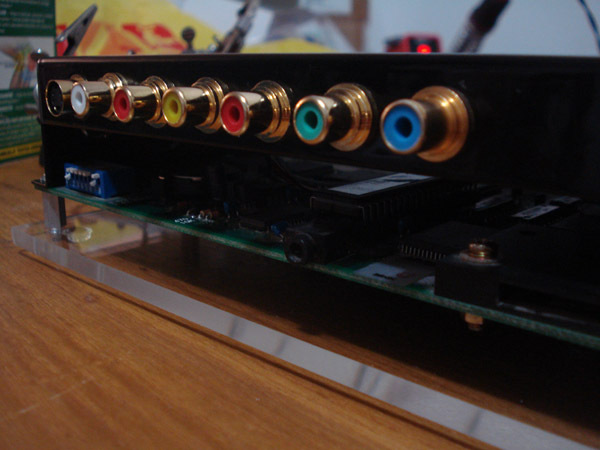 Since I removed the internal video encoder board I had to use a sheet of pleiglass to anchor all the jacks. This is the CMVS I built for Earthquake24. 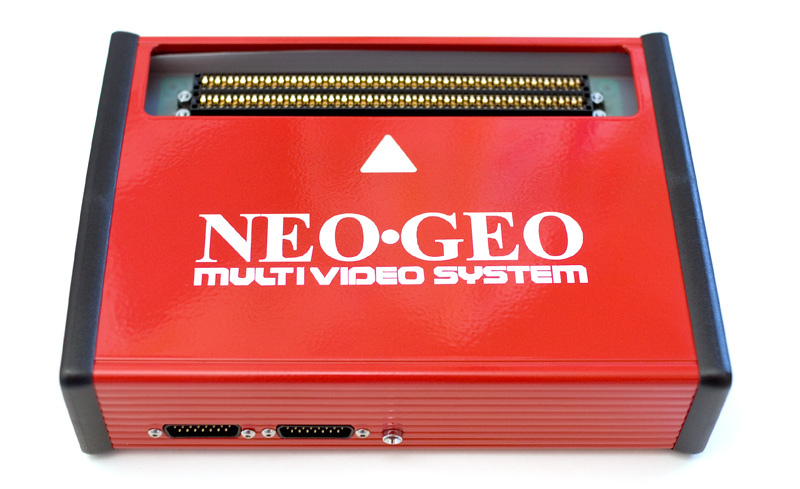 Equipped with an MV-1C, Unibios 2.3 w/socket, MVS Battery mod, MV-1C stereo mod and a Neobitz V2 video encoder. This is the back shot of the CMVS. 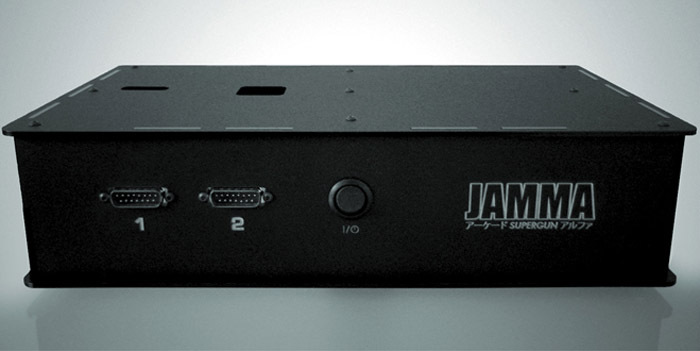 Of course it has Component, S-Video, Composite as well as stereo output. Side shot of the CMVS showing the evil red glow in the vents. I had to use hot glue to disperse the light evenly in the vents. 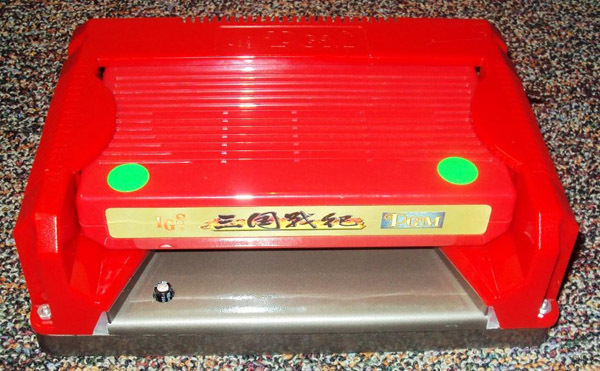 This is another shot showing the red glow within the CMVS. This is the CMVS I built for stormy. Based off an MV-2F. 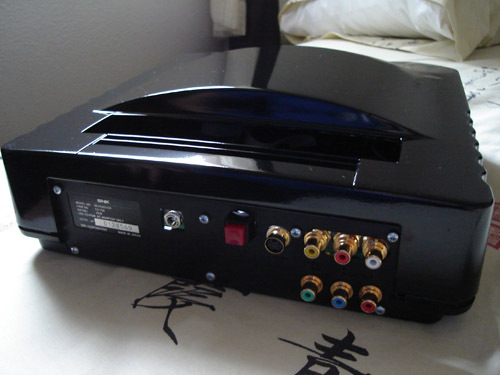 Has all the trimmings, Component Video, S-Video, Composite Video, Stereo Output, Unibios 2.3, MVS battery mod, Plexiglass base, aluminum standoffs, gloss black powdercoated finish. 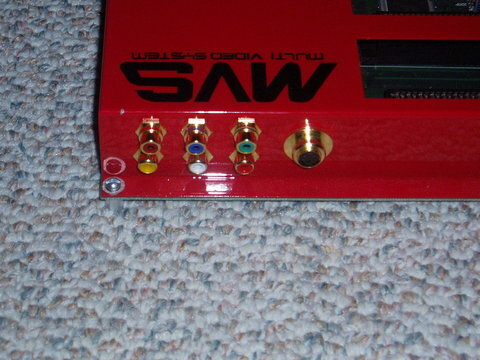 This is a shot of the gold audio/video jacks. 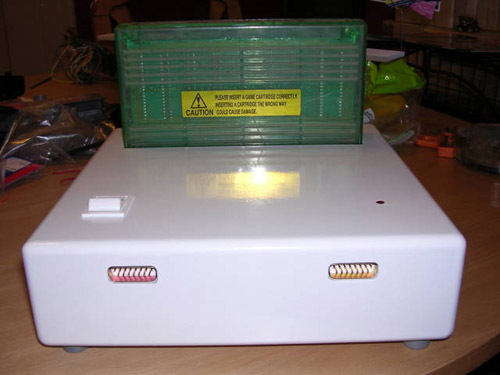 Back panel with round rocker switch as well as 2.5mm chassis mount power jack. This is the CMVS I built for Mike Yagami. Based off an MV-1F. 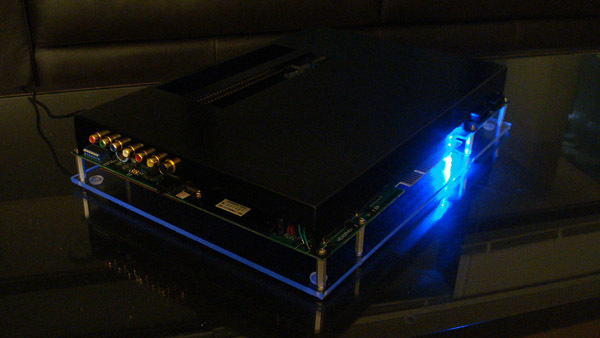 Has all the trimmings, Component Video, S-Video, Composite Video, Stereo Output, Unibios 2.3, MVS battery mod, Plexiglass base, aluminum standoffs and a little soft blue underglow. Front of CMVS and here you can see a little of the glow. Didn't want anything crazy. You may also notice that the plexibase is actually buffed. I sand and buff the plexi as I don't like the "cut" look much. 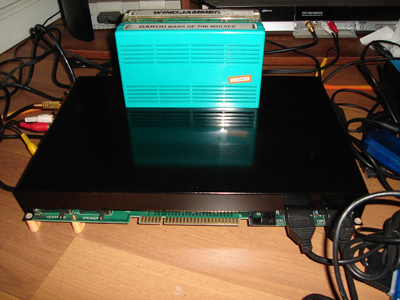 Unibios shot. 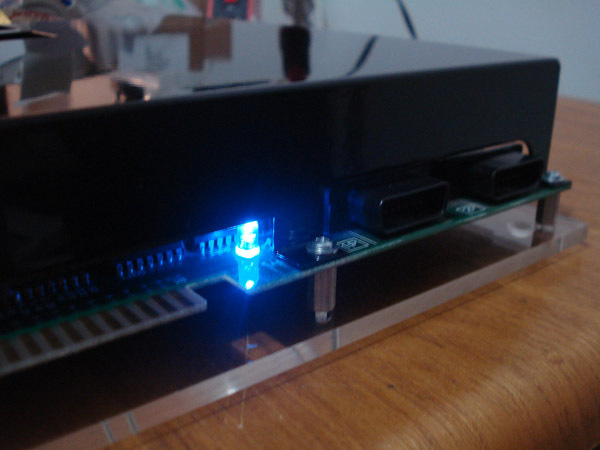 You can see the blue LED light shine around the plate-throughs. This is the CMVS I built for my "Obsidian" Series of CMVS units. This is Unit one. Based off an MV-1FS. 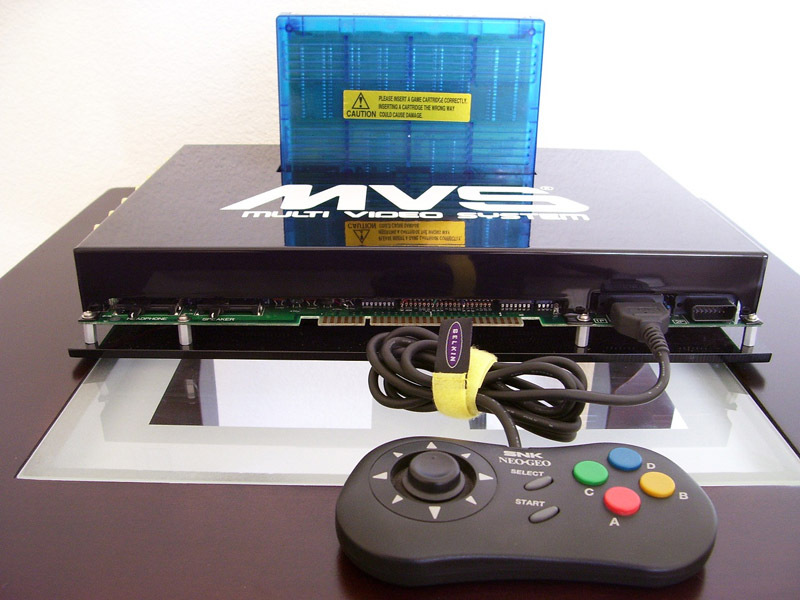 Has S-Video, Composite Video, Stereo Output, Unibios 2.3, MVS battery mod, black plexiglass base, aluminum standoffs as well as a removeable jamma edge cover. 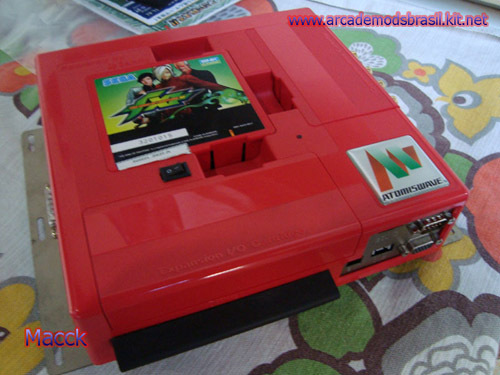 MVS battery mod. 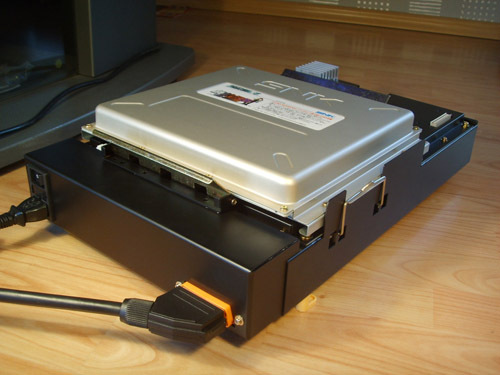 This is to eliminate the need to charge the on-board battery. 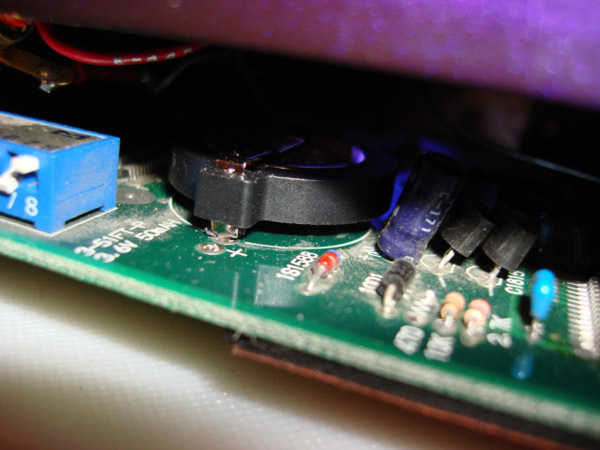 Uses a simple CR2032 coin cell battery to hold your settings. This is the CMVS I built for OMF2097. 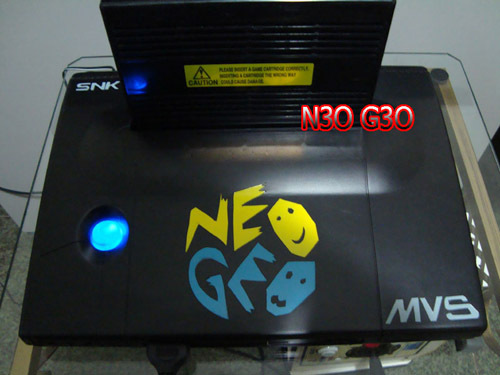 It has S-Video, Composite Video, Stereo Output, Unibios 3.0, MVS battery mod and a Neobitz-S. 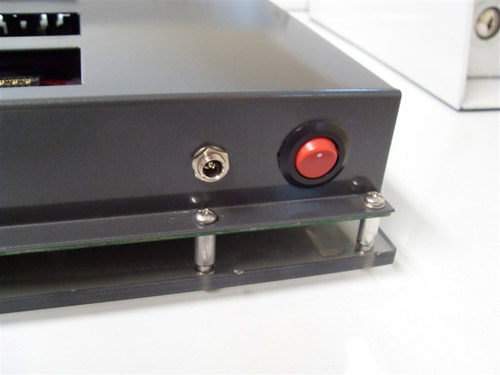 Since the enclosure is as long as the MV1C I had to raise the board using 3/4" aluminum standoffs so the audio/video jacks would have room to be mounted. 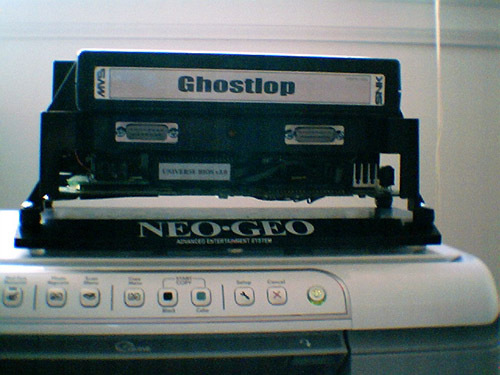 This is the same trick I had to do with my Garou CVMS. 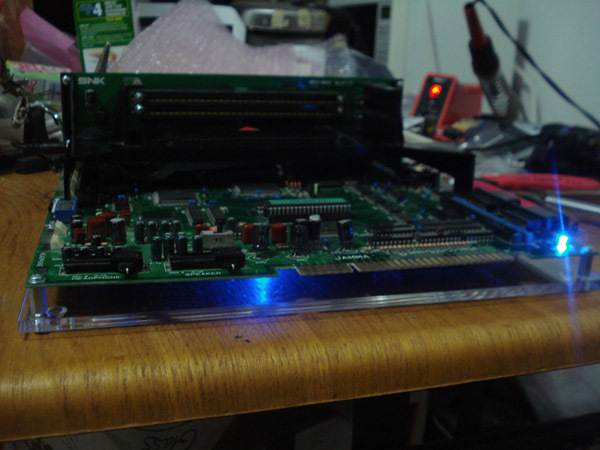 This is the blue glow from the slot. Daytime shot so it will be brighter at night. 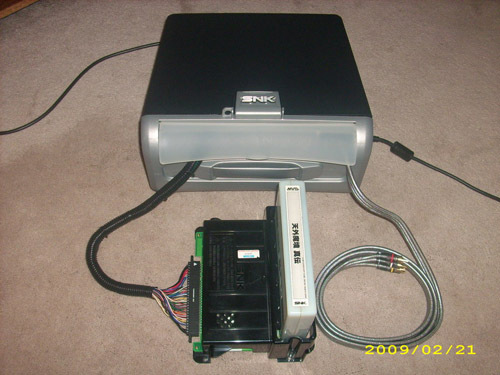 This is a CMVS I built for a JNX customer. 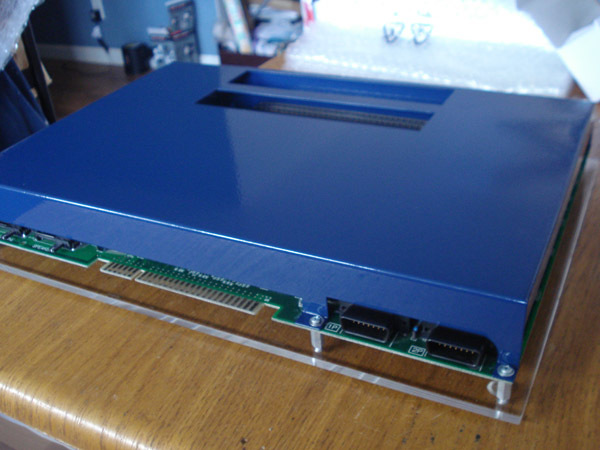 It has RGB AES Style Socket, Stereo Output, Unibios 3.0, MVS battery mod and a Postal Blue powder coated finish. This is a shot of the back side. 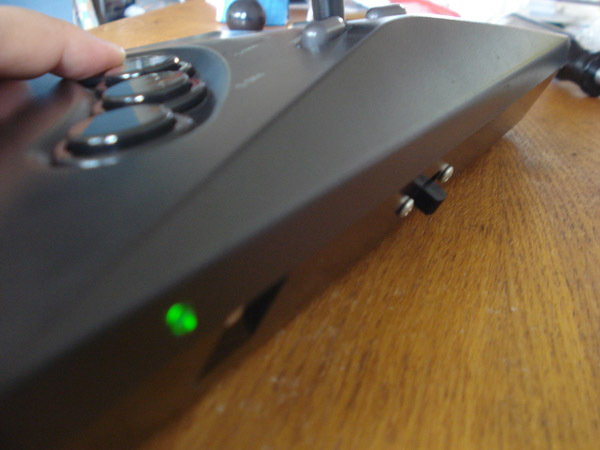 Close shot of the power jack and switch. 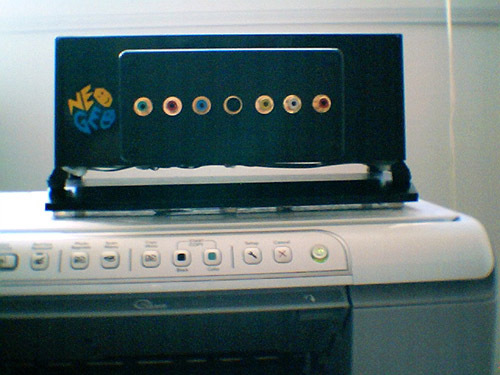 AES Style socket and stereo jacks. This is the CMVS built by kpj. 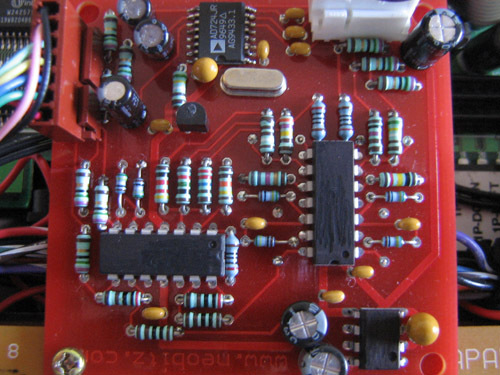 Rewired, standoffs added and under glow added by Xian Xi. 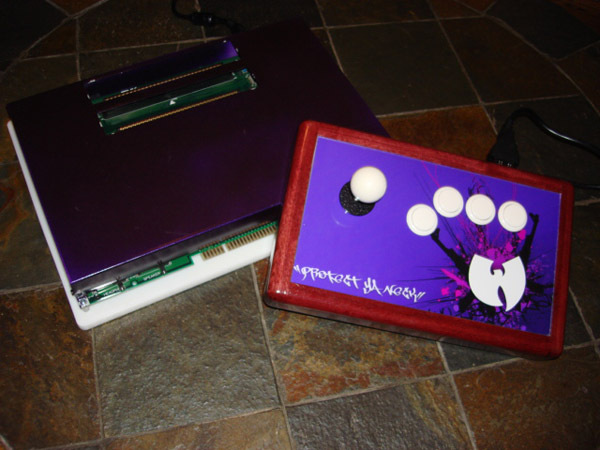 Custom joystick built by ecksnine made with purple heart wood and Sanwa parts. 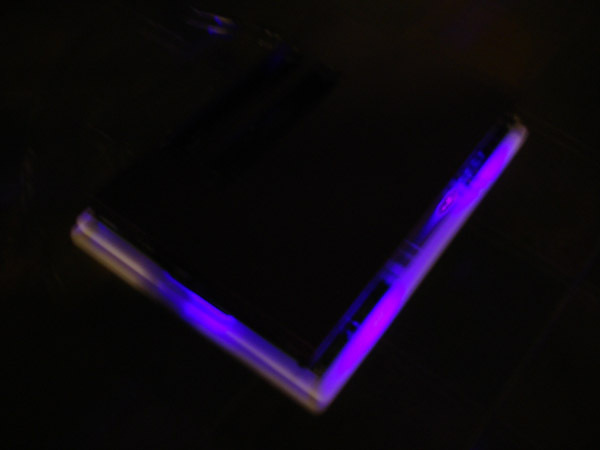 This is a shot of the purple underglow. 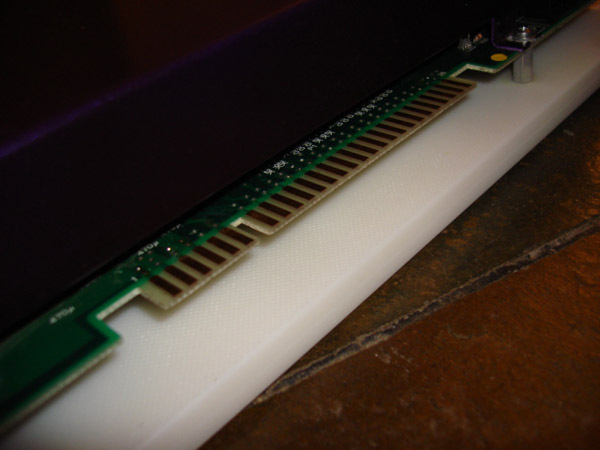 The jamma edge was cleaned off, it previously was covered in hot glue. Not easy to remove hot glue but it takes time. 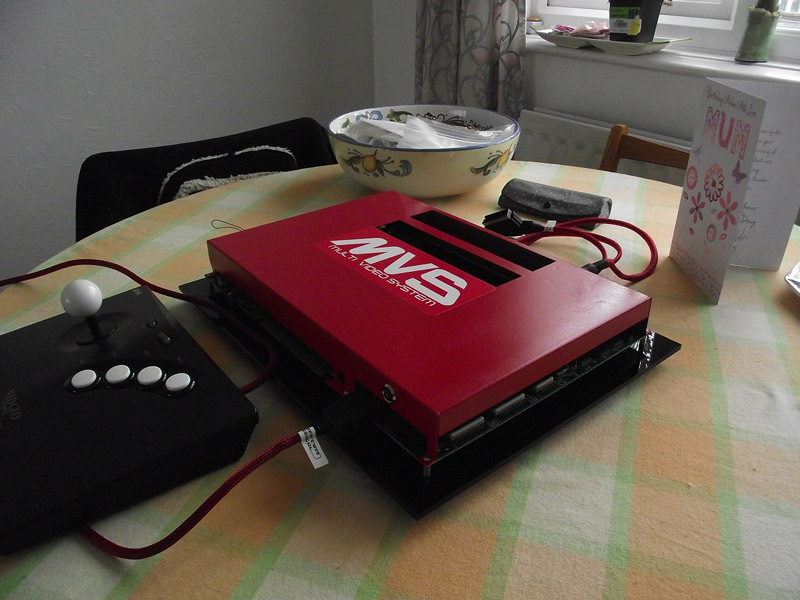 This is a shot of the MVS battery mod. You can read about it in the tutorials section. 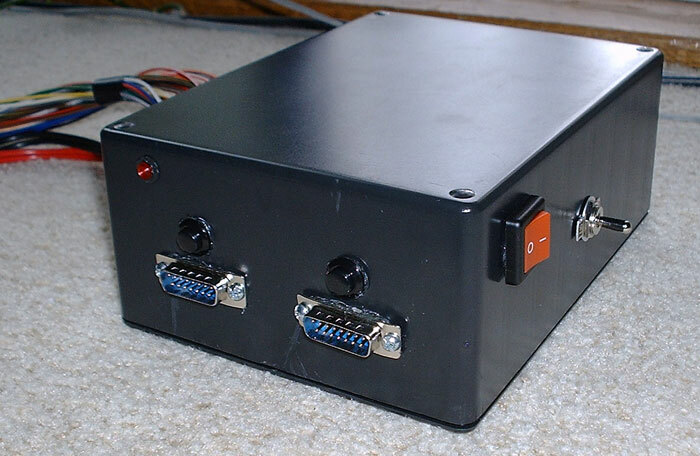 This is the first Supergun I have built. 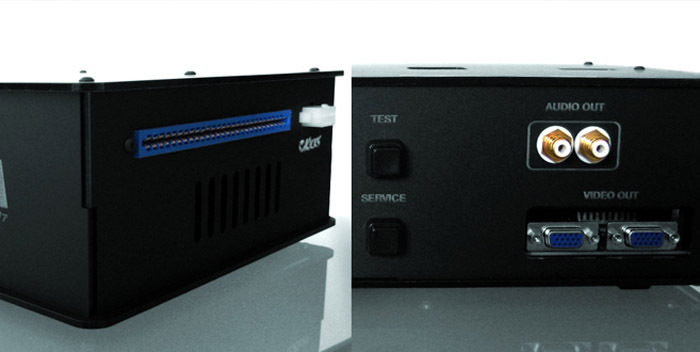 I wanted everything all in one including the power supply which is able to deliver [email protected], [email protected] and [email protected] It has never let me down. 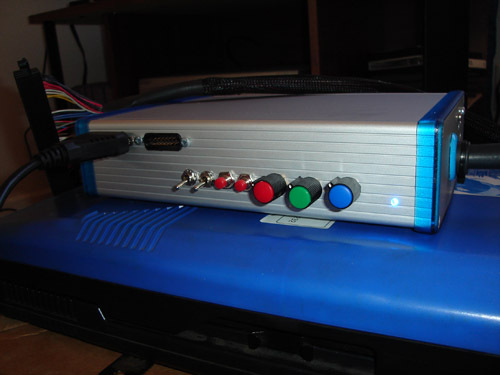 Side view of my Supergun. It has an internal fan to keep the temp down. 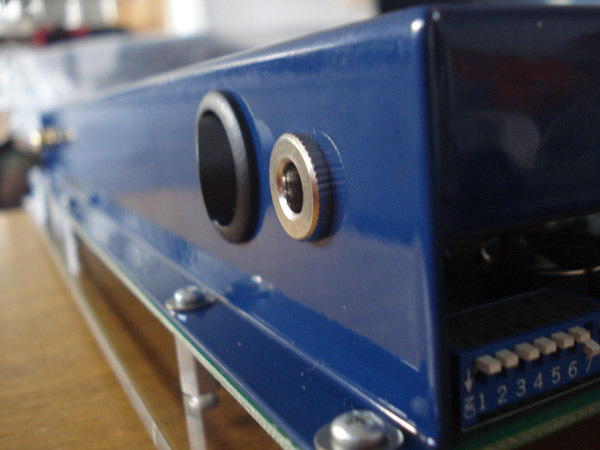 You may also notice I used a 24mm blue Sanwa snap in button as a grommet for my Jamma harness. 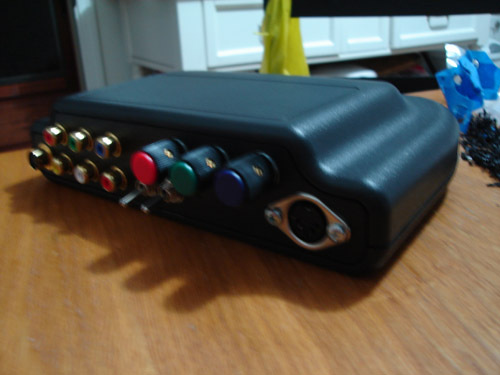 This is the back view of my Supergun. 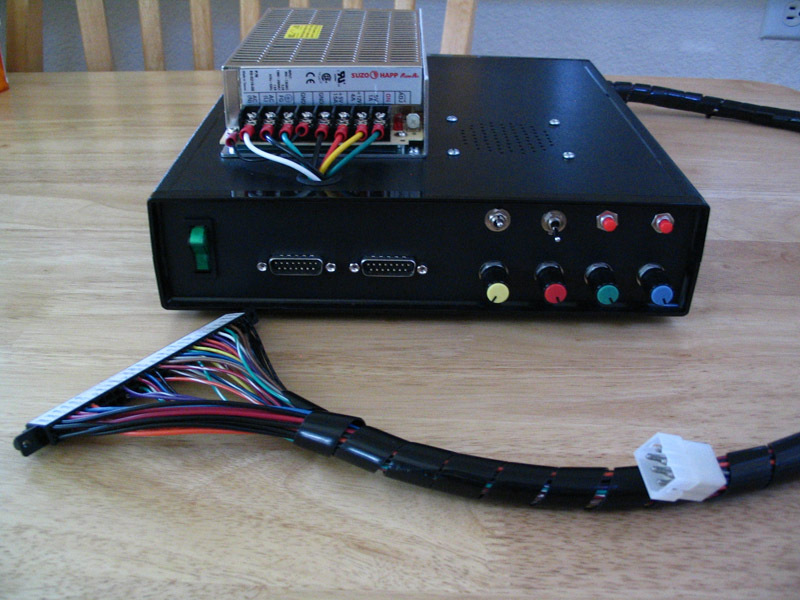 This is the Supergun I built for Boss0033. 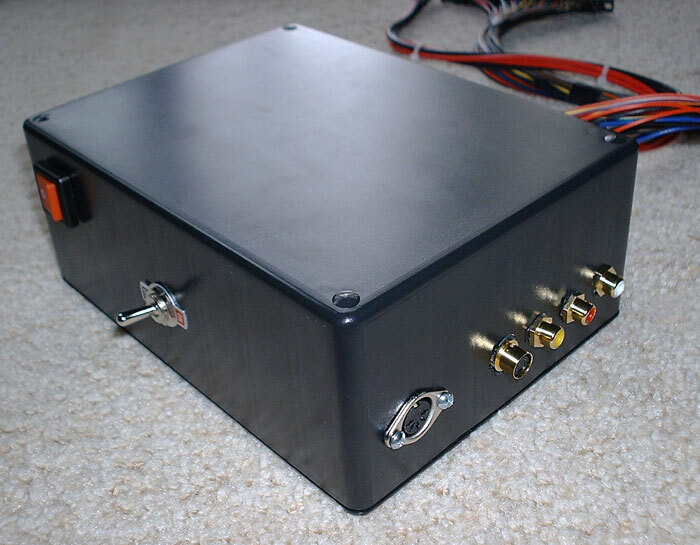 I wanted to keep the enclosure very small so I opted for an external power supply. 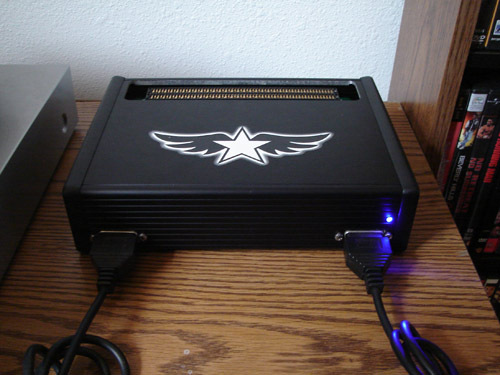 The is the enclosed arcade PSU I made for use with the Boss0033 Supergun. 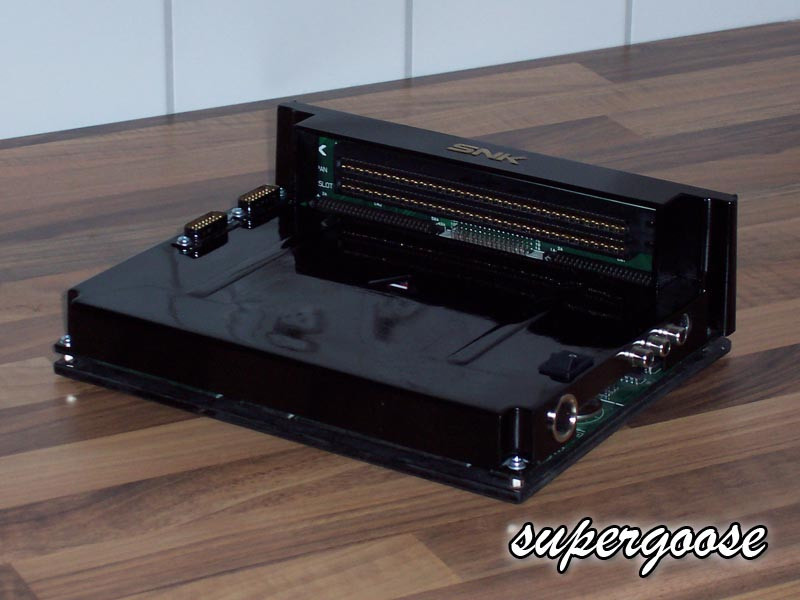 Another view of the Boss0033 Supergun. 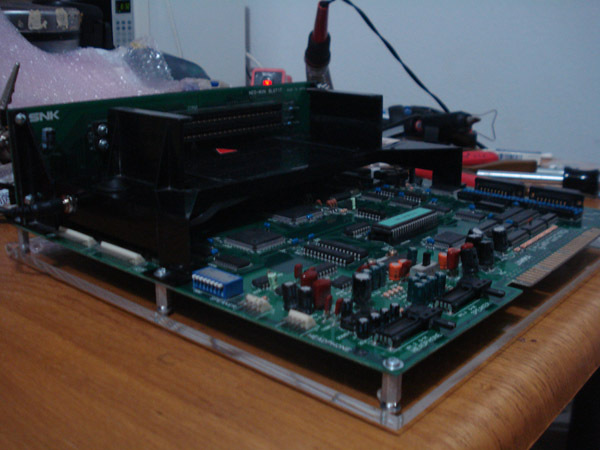 This is a Jamma test rig I made. 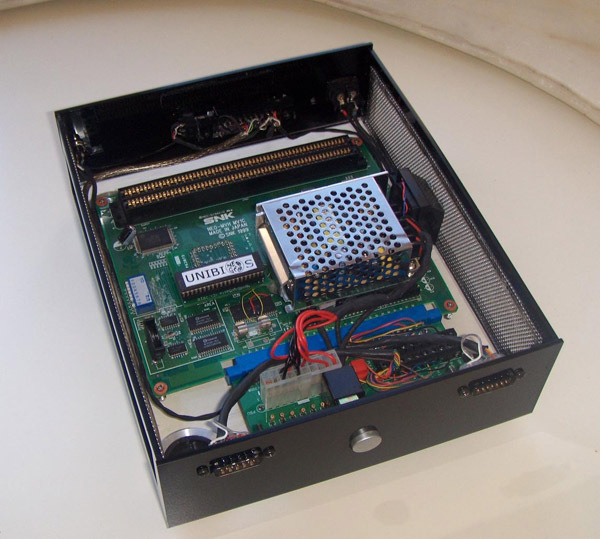 Inside is a JROK 3.1 video encoder and JROK sync cleaner. 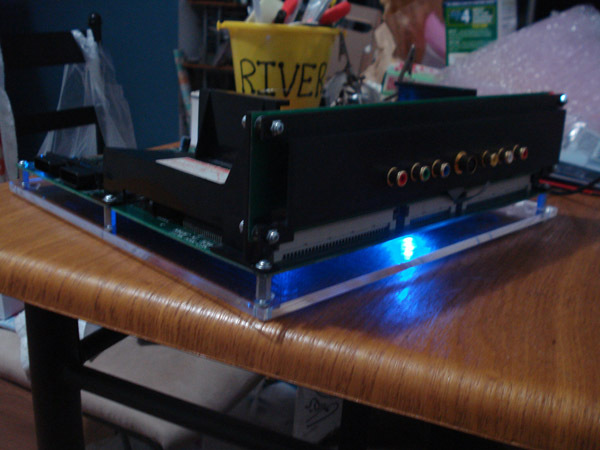 I made this test rig mainly for repairing arcade boards. I made the wire bridges with bare wire. 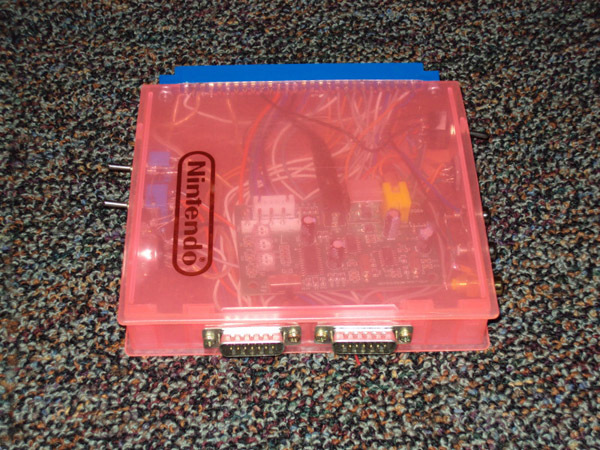 This way I could easily test connections to and from the board. 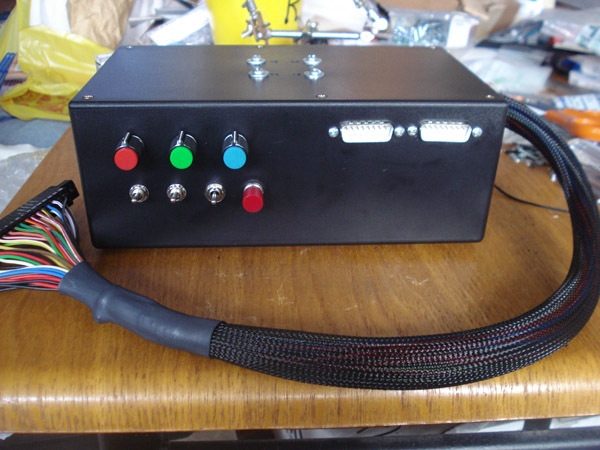 The is the back of the test rig. 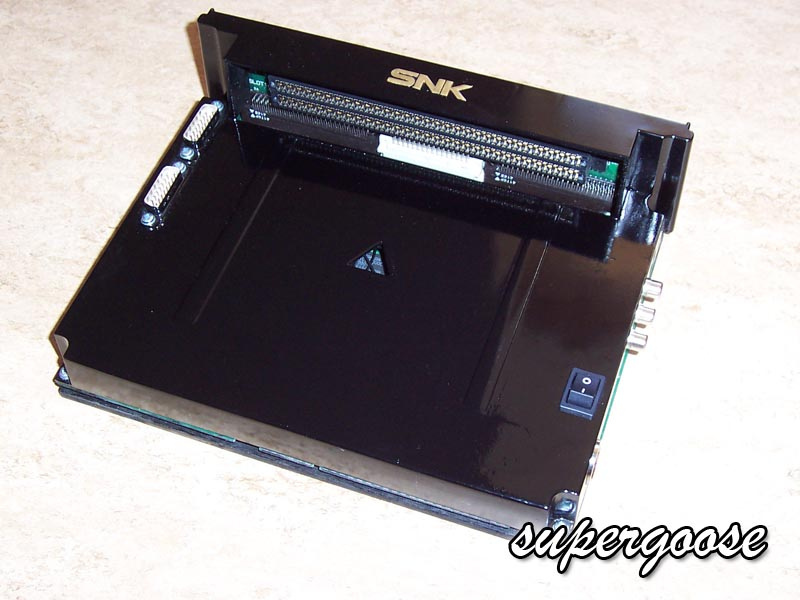 This is the Supergun I built for Aznsmith. I wanted to make an all in one unit like my first. The holes along the bottom are air vents. 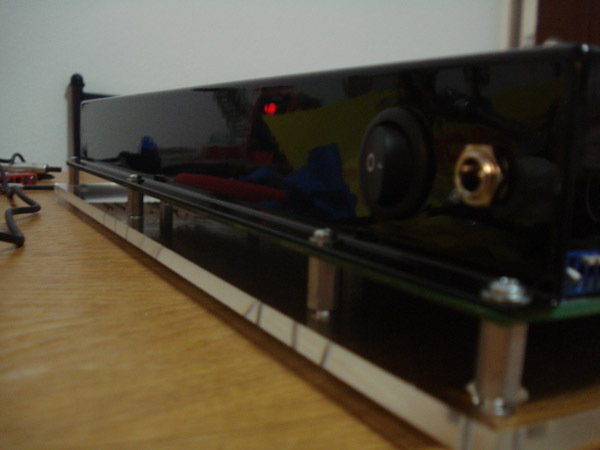 The is the front of the Supergun. 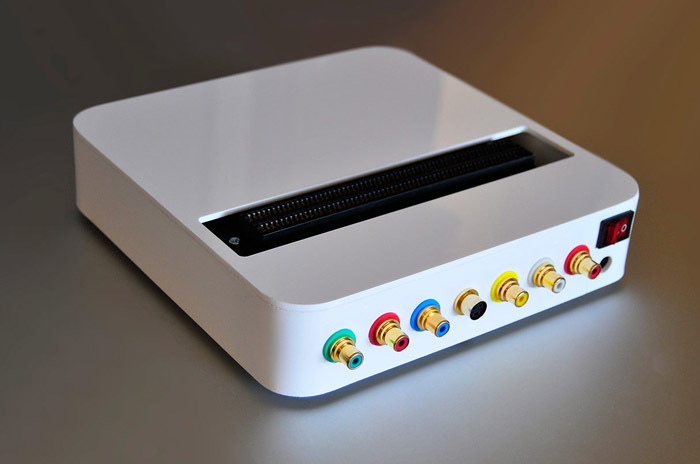 Has everything RGB Pots, Sync Cleaner, Audio Atten, MVS/Jamma Test Switch and Service Button. 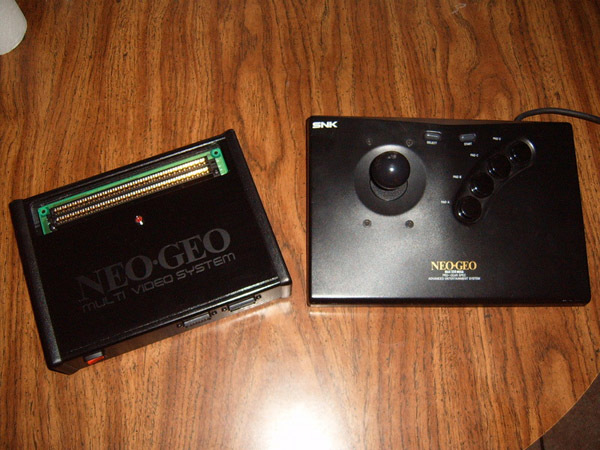 The Control ports are NeoGeo compatible. 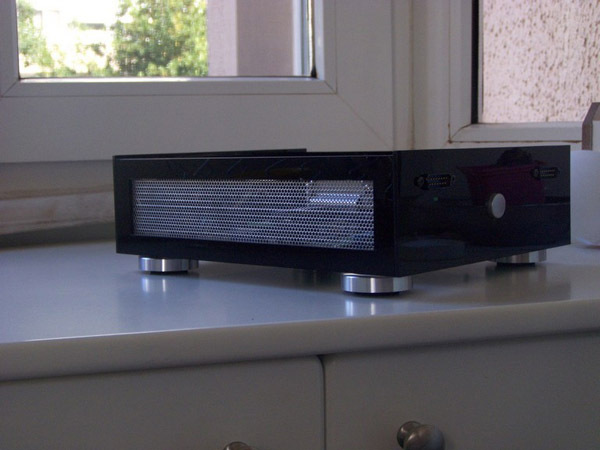 The unit also has an internal fan to keep the airflowing. 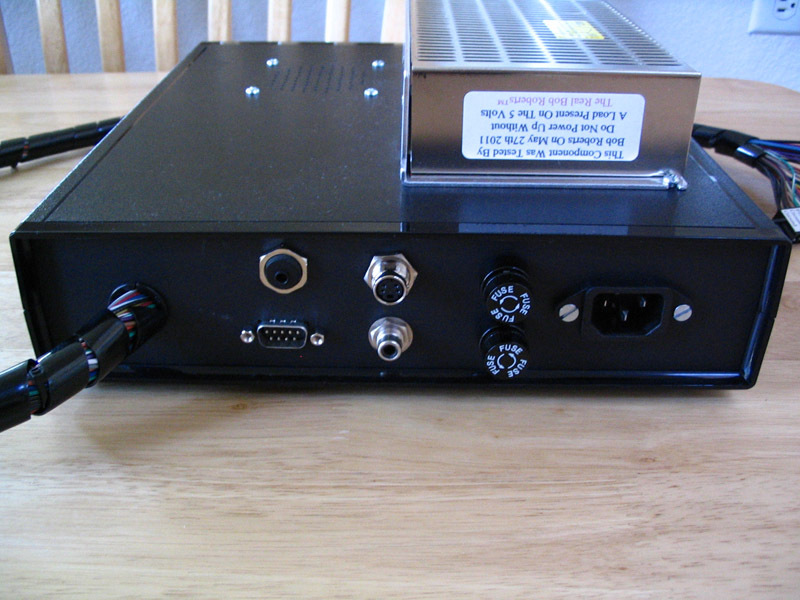 Back view of the Supergun. You can see the customer requested only Component output. 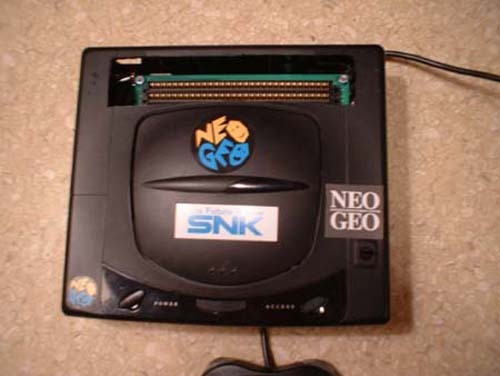 This is the first Neo Geo wireless controller I made. 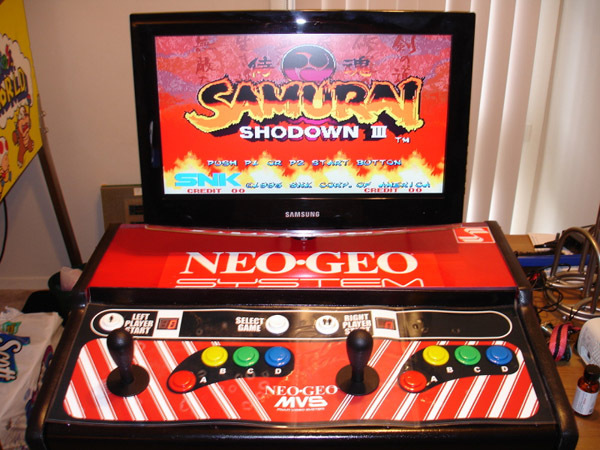 It has Seimitsu 24mm Black screw in buttons, Sanwa 35mm Balltop and a black LS-30 shaft cover. The stock square gate has been modded to an Octo-gate. 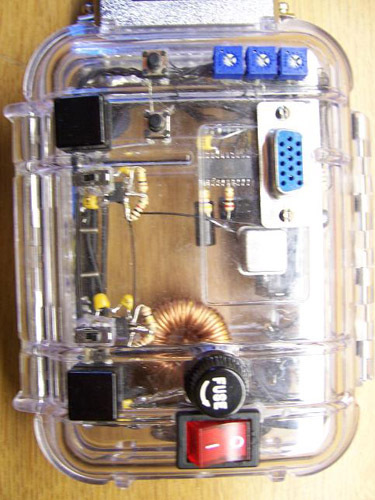 Here you can see the status LED along with the on/off switch. 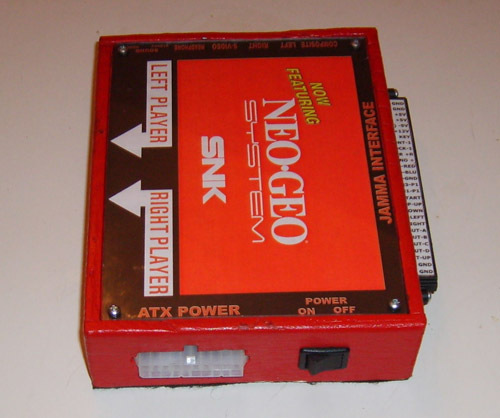 This is the second version of the Wireless Neo Geo Controller. 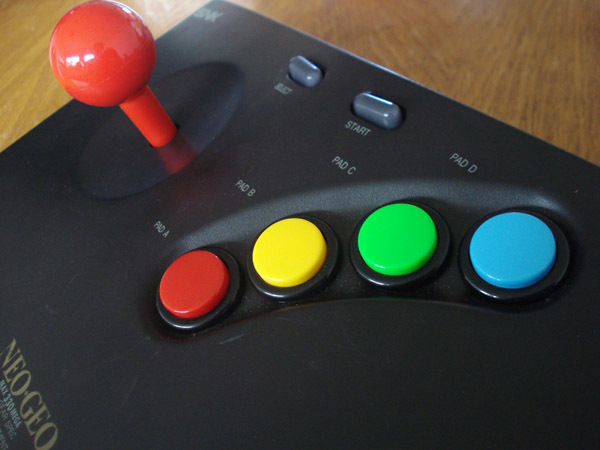 This one uses colored 24mm Seimitsu Screw-in buttons to match the color layout of the Super Neo 29. 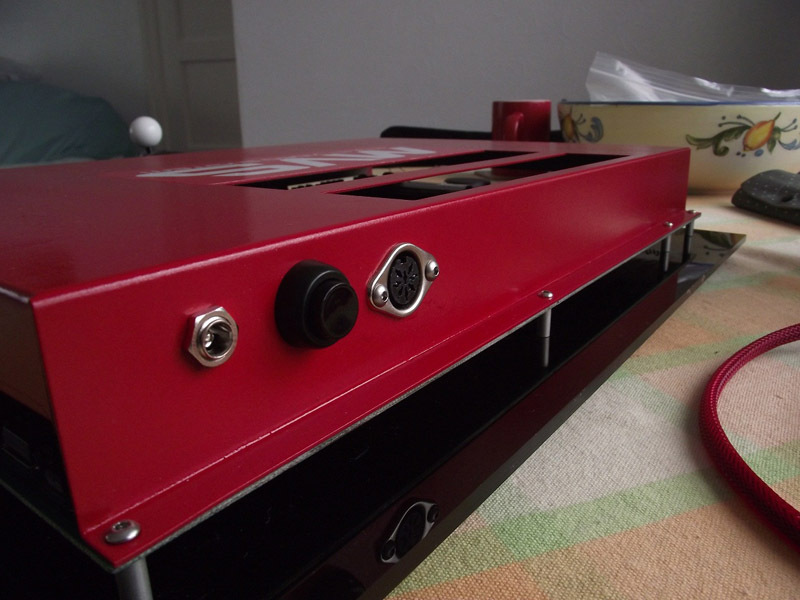 It also has a red 35mm Sanwa ball and LS-30 red shaft cover to finish the look. 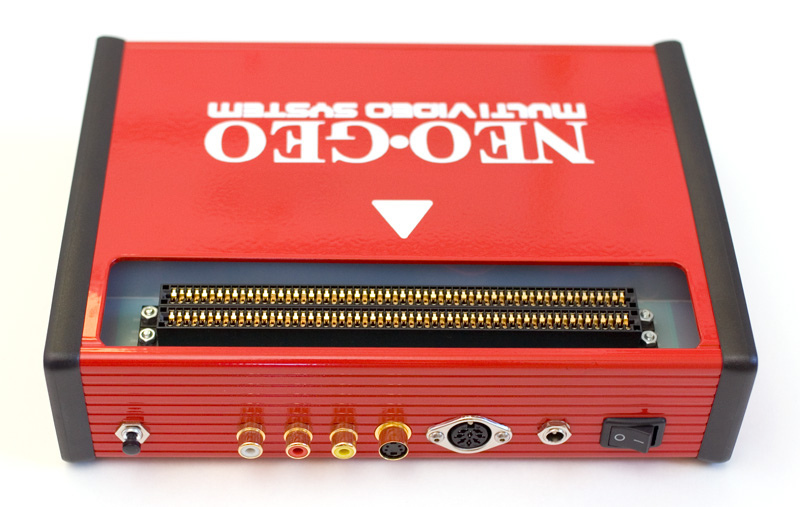 This is the first version of the Neobitz video encoder. 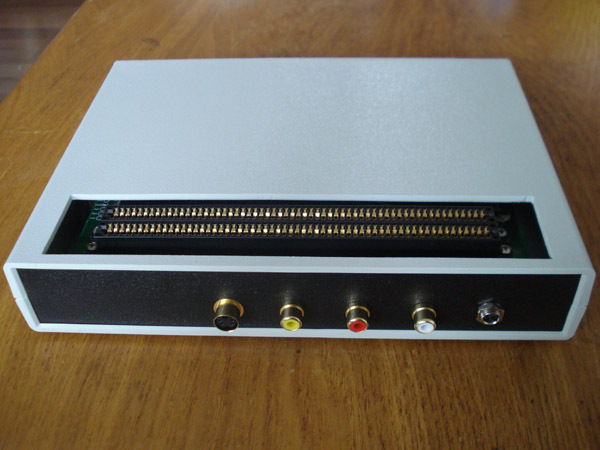 The encoder outputs Component, S-video and Composite video. 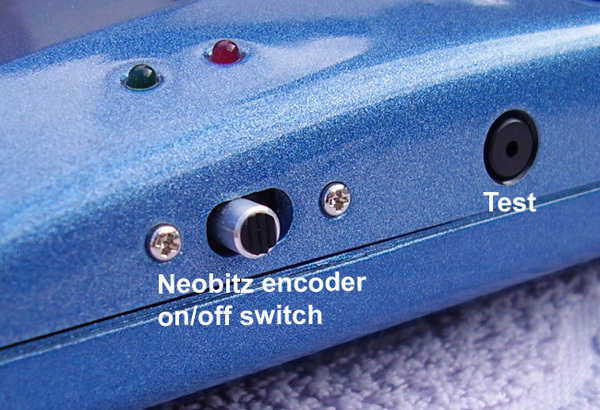 This is the second version of the Neobitz video encoder. 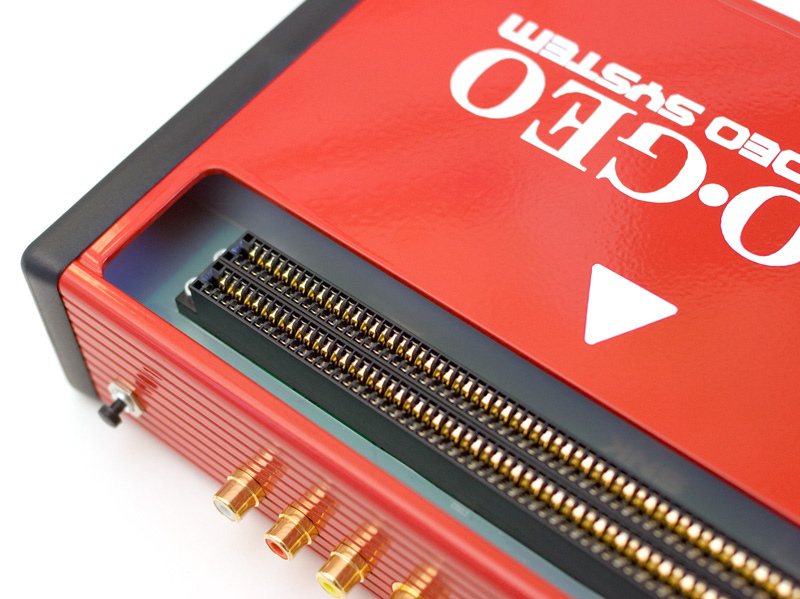 An onboard Sync cleaner and optional power LED were added. 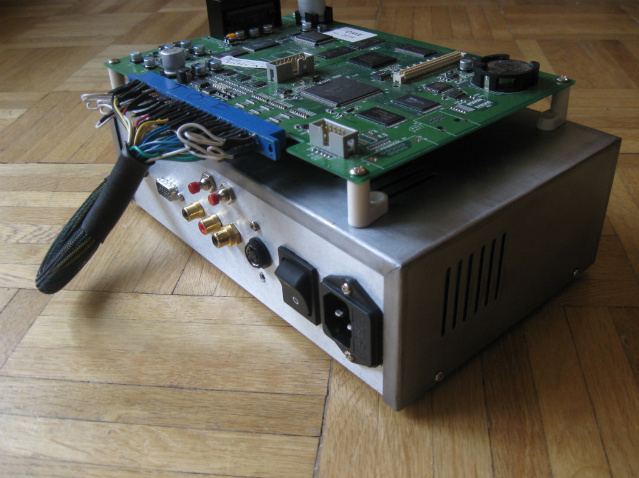 This is the Neobitz-S video encoder. 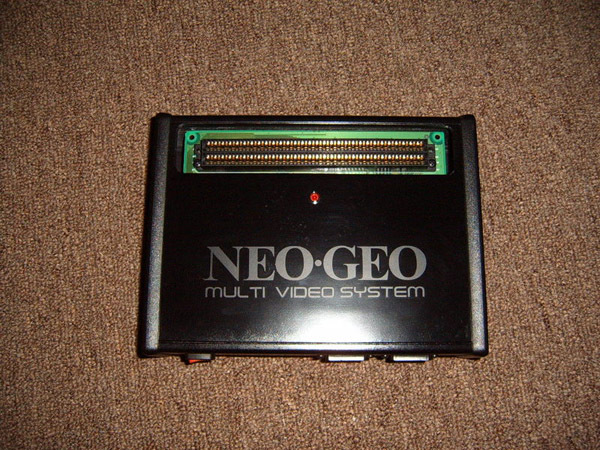 This version only outputs S-video and Composite video. Instructions for the DIY Kit here. 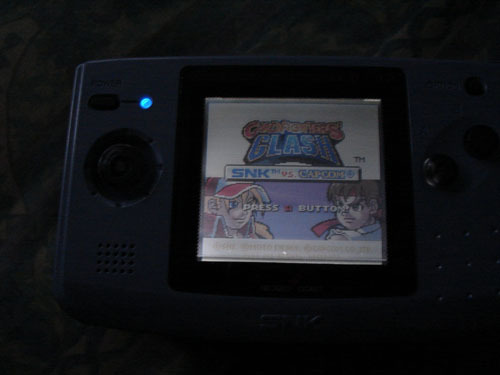 Front lit Neo-Geo Pocket color. 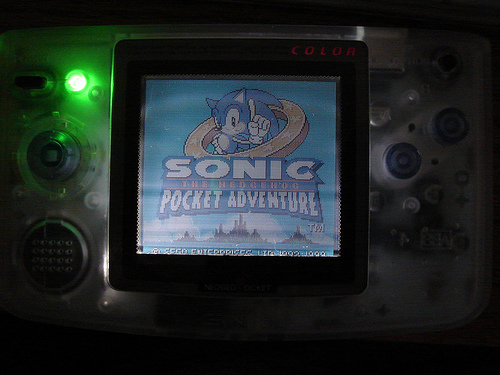 Front lit clear Neo pocket color. Keep in mind when modding a clear unit you have to cut about 1/2" off the light screen which is not easy to do. 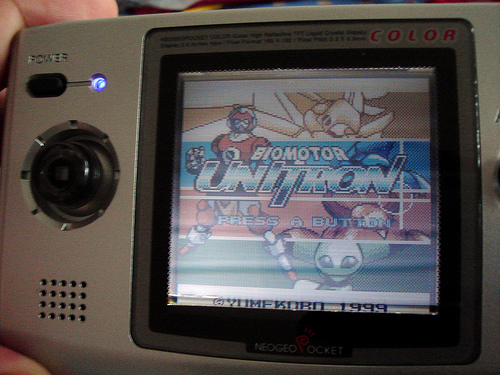 A nice front lit silver Neo pocket color playing Biomotor Unitron. 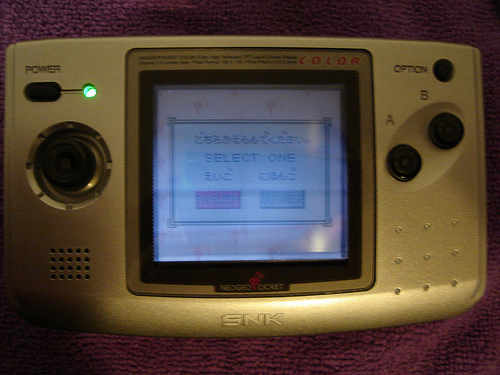 A front lit Neo pocket with the common oil spot blemish. This is from the LCD screen of the SP. I don't know how it gets on the screen but it does. 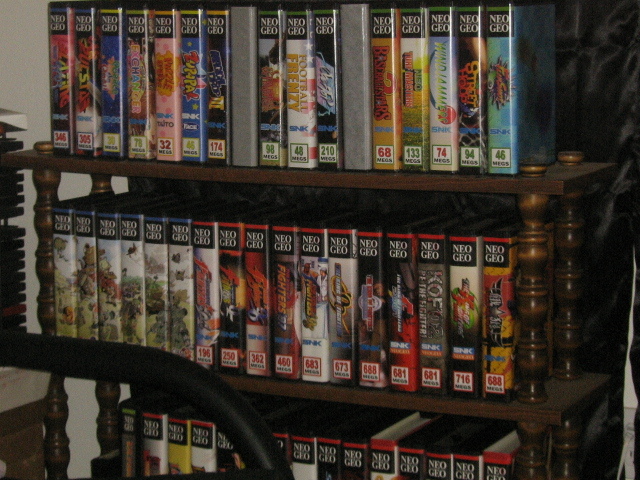 My Neo Geo MVS Collection. 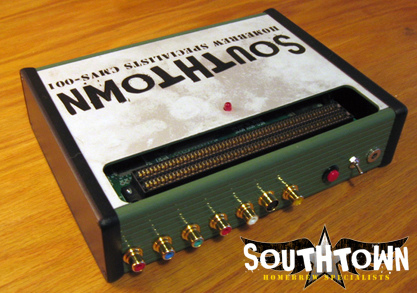 Shockboxes are from Big Bear and inserts were printed at Southtown Homebrew. 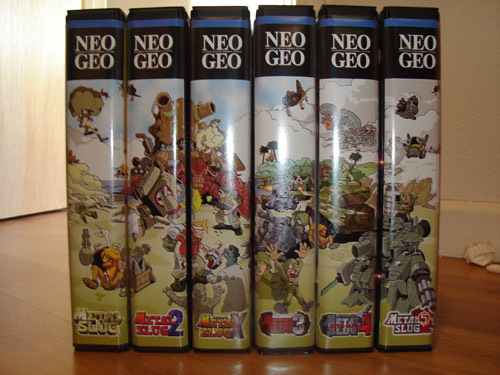 Notice the Metal Slug boxset I made. 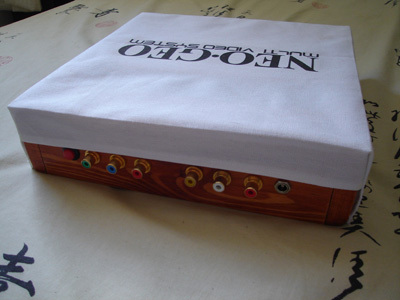 My Neo Geo MVS Metal Slug boxset I made. 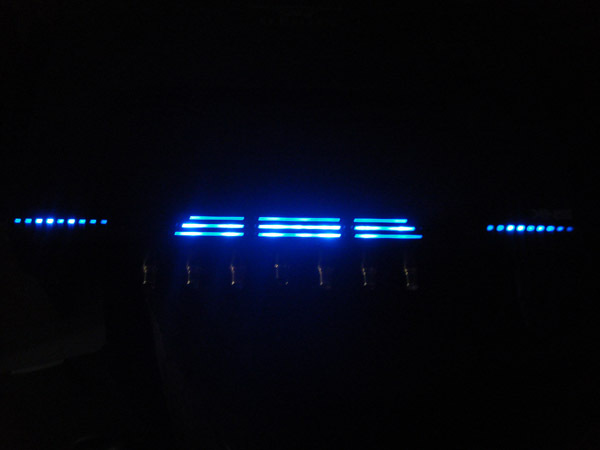 Blue vents on the AES. 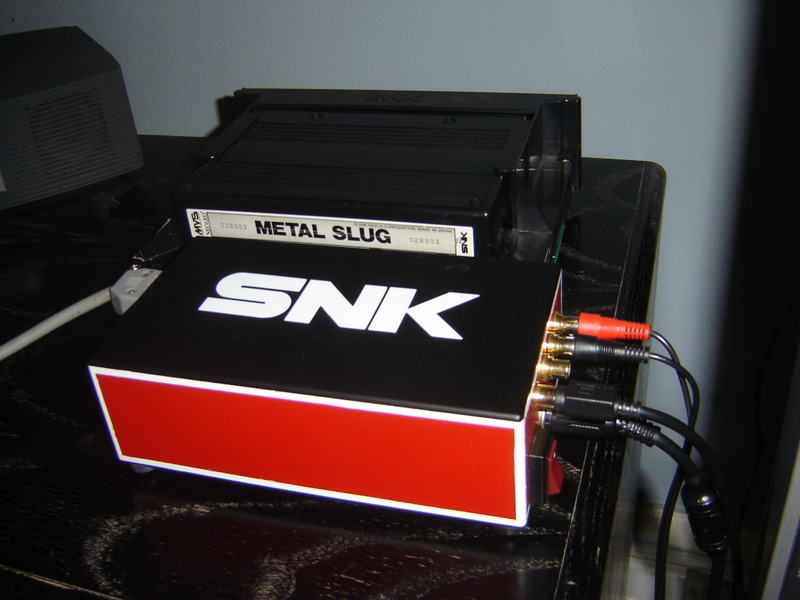 Custom built Supergun by Lee Doyle. 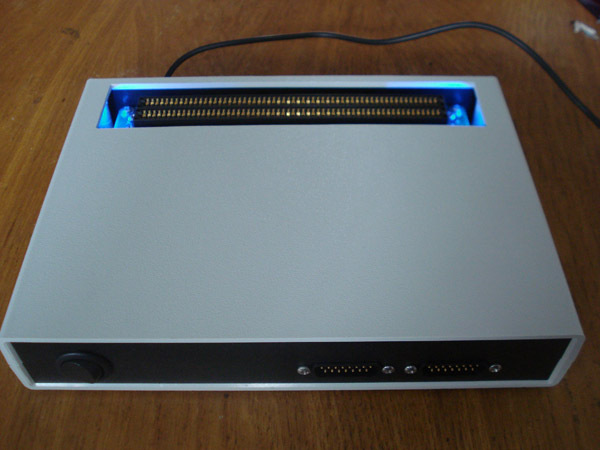 Enclosed in a custom Acrylic enclosure, it features an RGB to VGA encoder, 8 pin molex kick harness as well as a 5v adjustment. 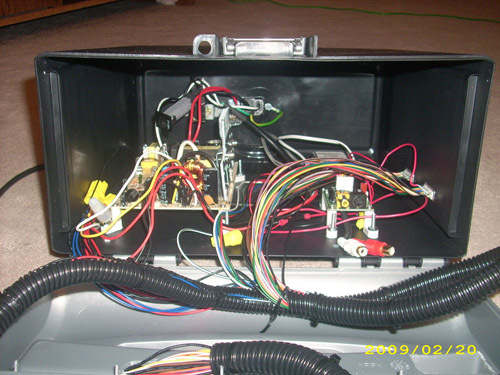 Inside shot showing the 5v adjust and video adjustments. 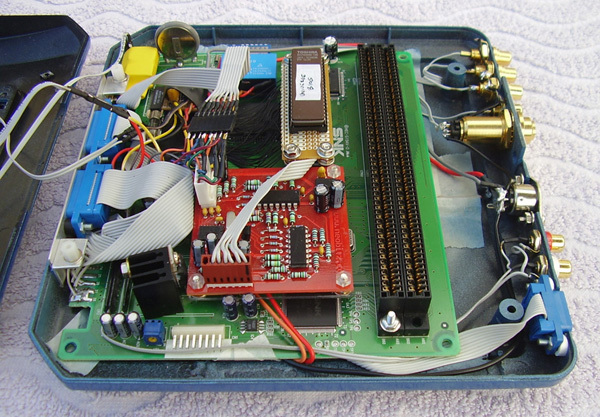 Rear shot showing the JAMMA connector, kick harness, stereo out, test and service switches and VGA output. Custom built CMVS by Beharius. 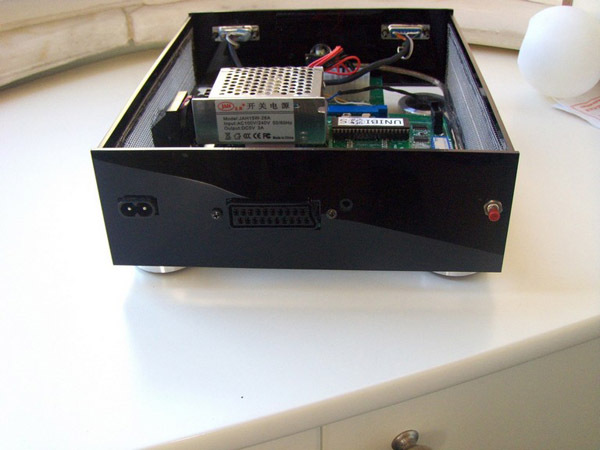 Enclosed in a custom Enclosure, powered by a completely internal PSU. 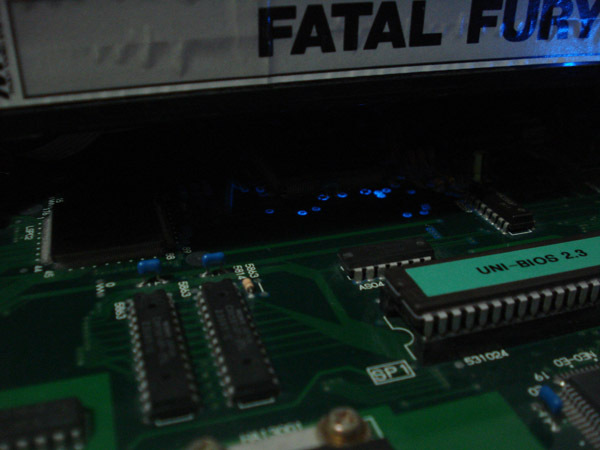 Inside shot showing the Unibios, PSU and Supergun inside the unit. 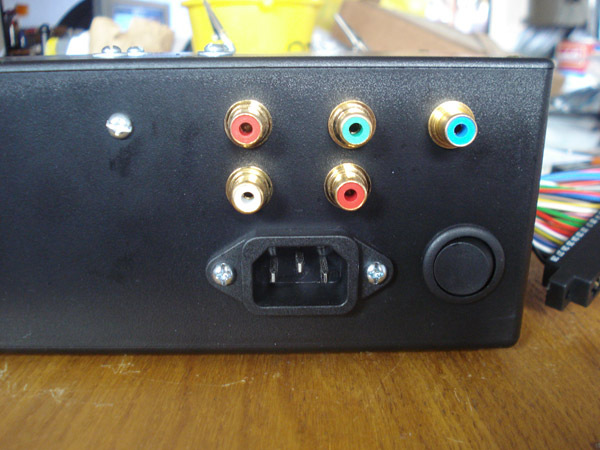 Rear shot showing the SCART socket, headphone jack as well as a test switch. Side shot showing the custom grill around the unit. 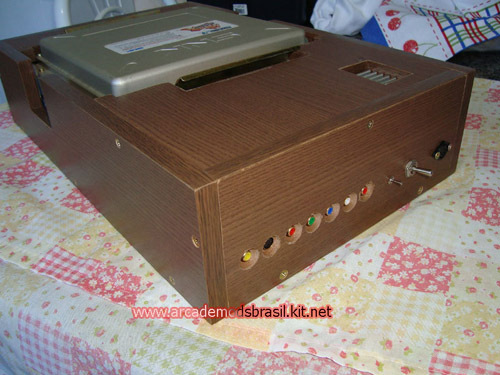 Custom built SuperGun by Rolins. 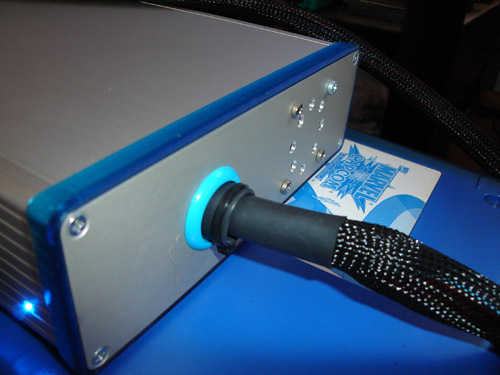 Enclosed in a Pactec Enclosure, powered by a Happ Suzo 130w PSU. 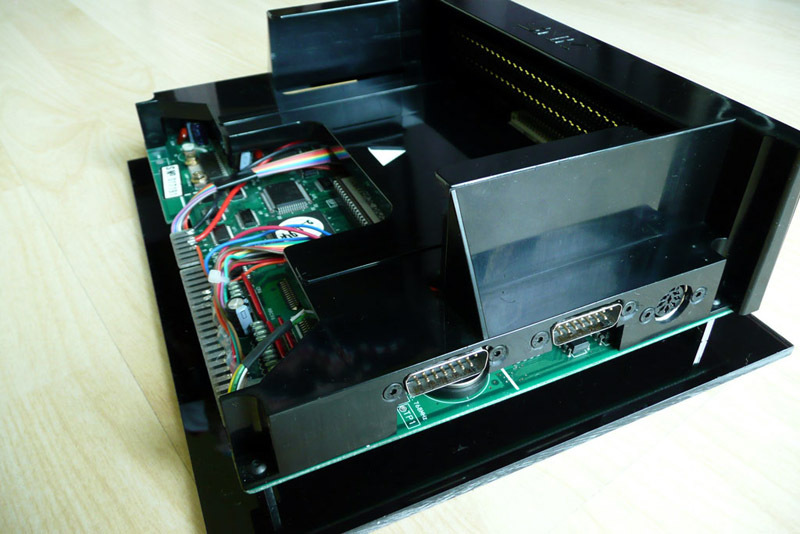 The SuperGun has DB15 controller ports using a Neo Geo pinout, Kick harness for CPS and MK games, RGB adjustment pots, a variable audio attenuator and video is handled by a JROK 3.1 encoder. 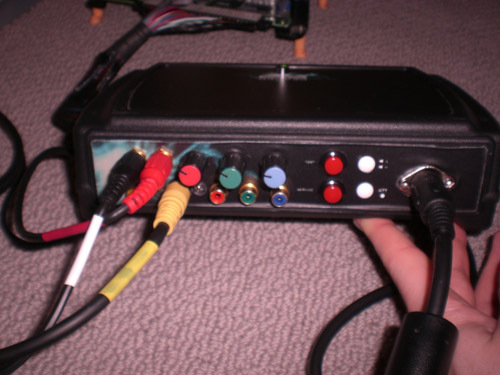 Rear shot showing RGB Output via the DB9 connector, stereo mini-jack for audio, s-video and composite as well as inline fuses for the +5v and +12v lines. 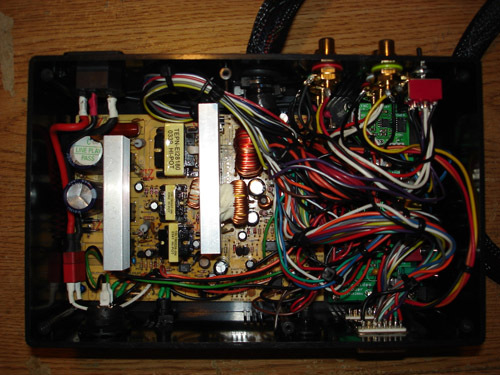 Inside shot showing the internal 3" 8ohm Tang Bang W3-881SJ speaker. 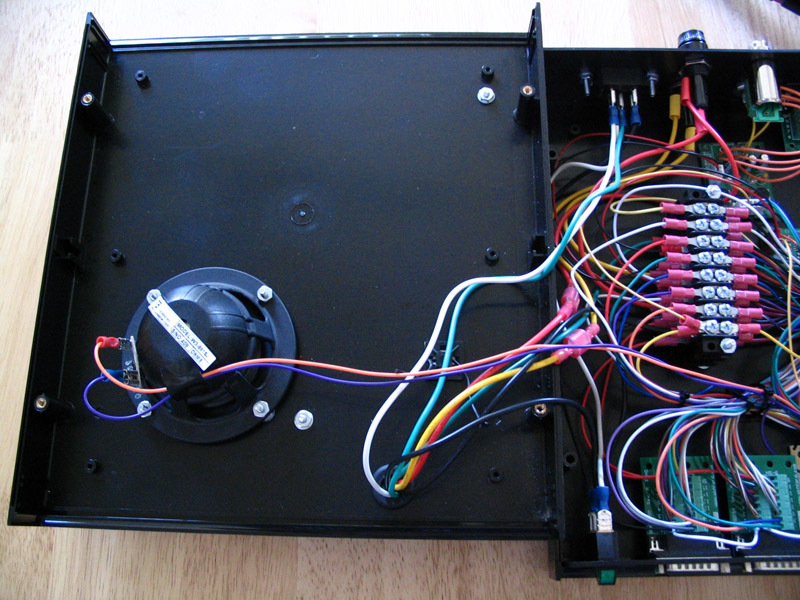 Inside shot showing the wiring array. 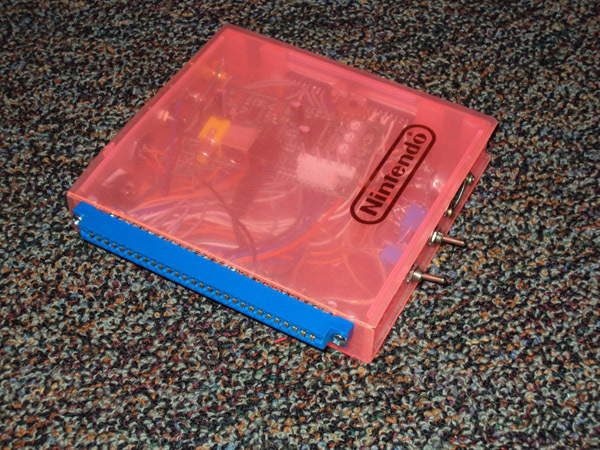 Rolins used a lot of quick disconnects and barrier strips to achieve a solderless array. Custom built CMVS by mmmonkey. Based on an MV1FZ. 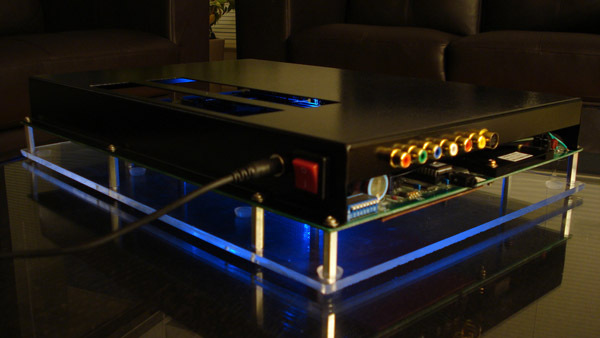 Front shot with black plexi, rainbow wiring and Unibios. 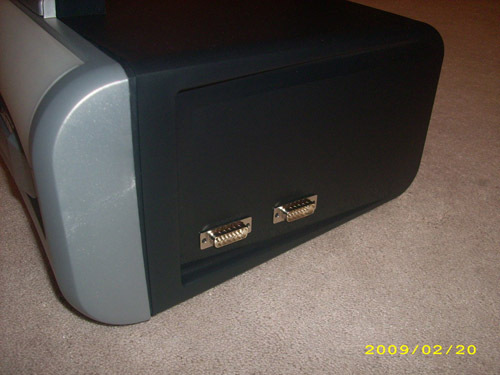 Side shot showing controller ports and AV socket. 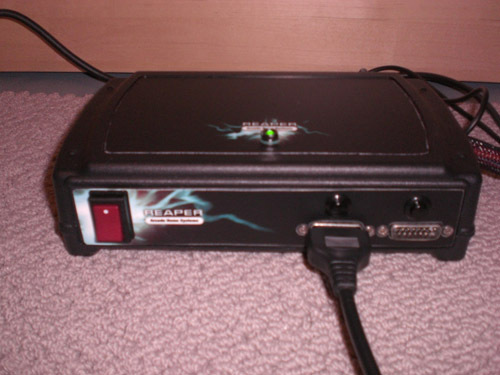 Other side showing power jack and power switch. 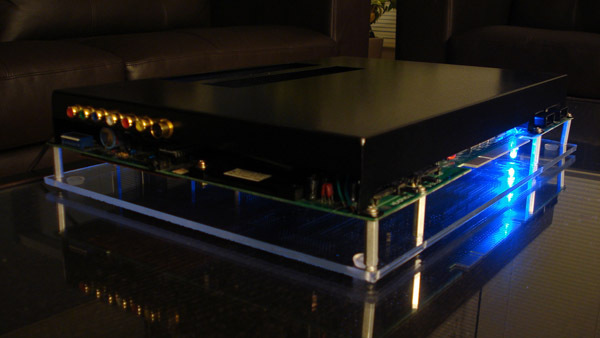 Custom built CMVS by Ocelete. 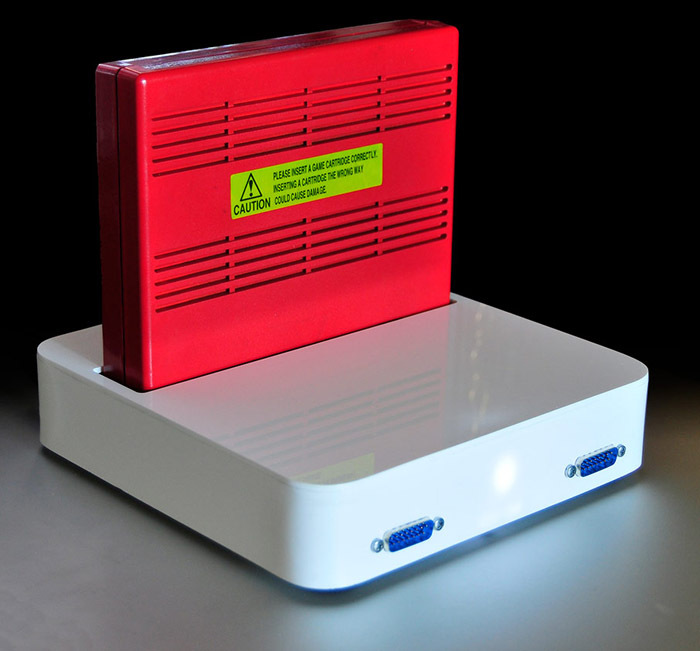 Inspired by the Apple TV, this CMVS has a custom made plastic case. 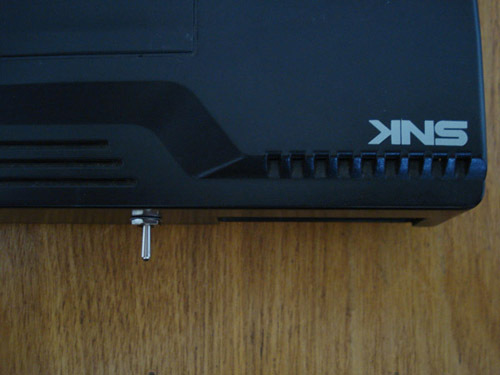 Rear shot with power jack, power button and AV jacks. 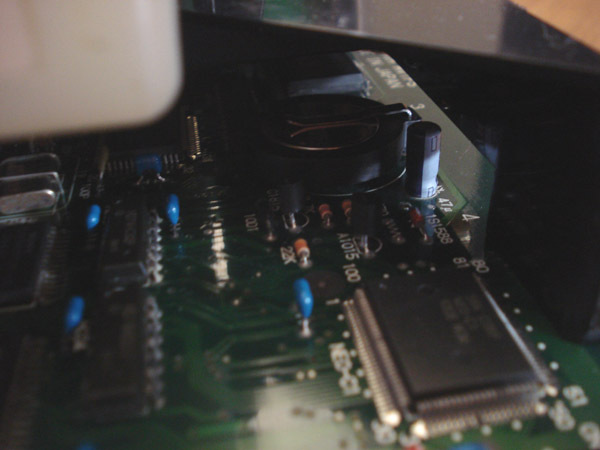 Inside is an MV1C top loading mobo. 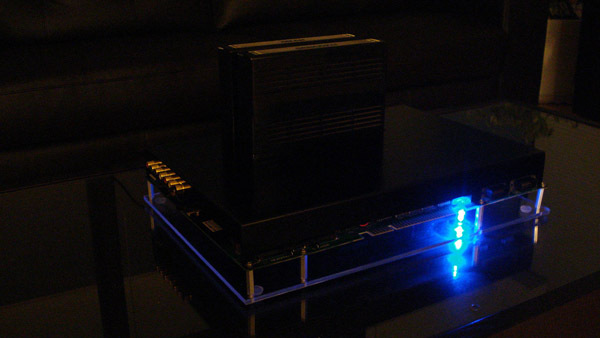 Power LED is located inside the enclosure and shines through the plastic casing. 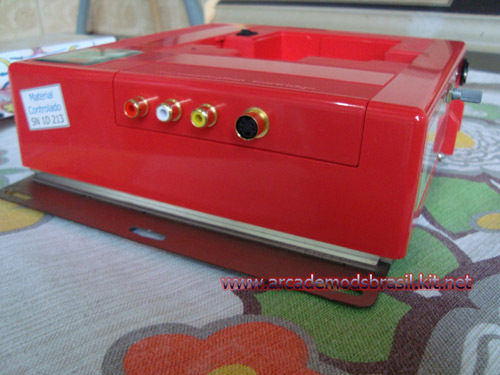 This is a similar CMVS but done in red, this unit also features an internal power supply. 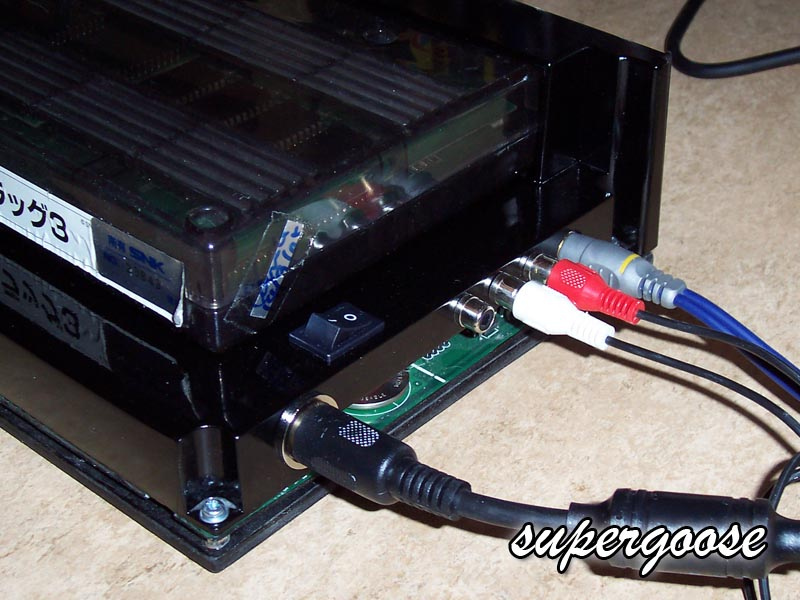 Custom built SuperGun. Red and black finish with nice big SNK decal. 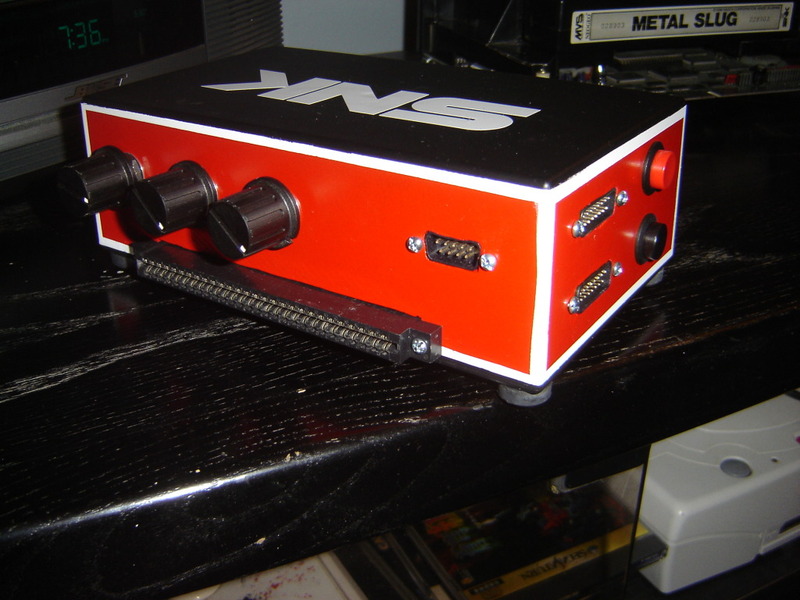 Side shot with power jack, power button and AV jacks. 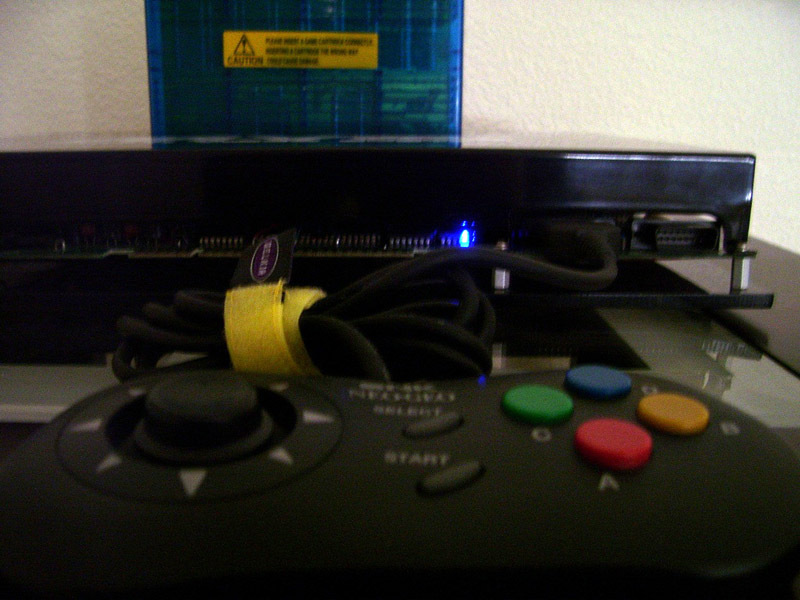 Opposite side shot with controller ports and test and service buttons. 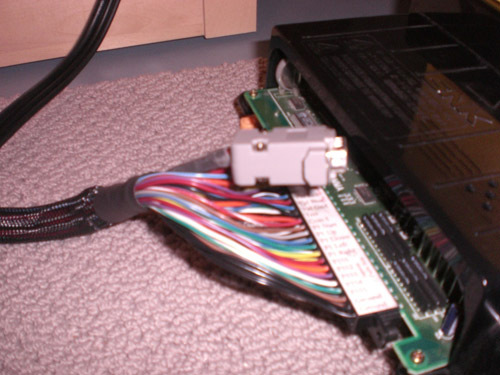 Rear shot with RGB pots and jamma connector as well as DB9 connector. Consolized MVS built by FA-MAS. 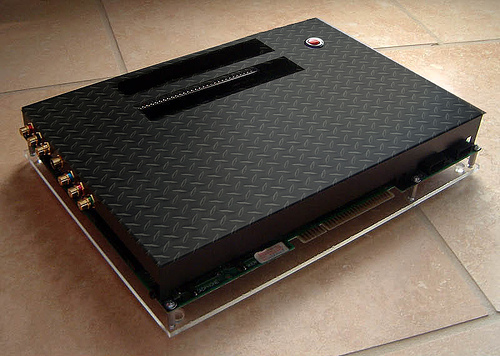 Slick black finish with black plexiglass. 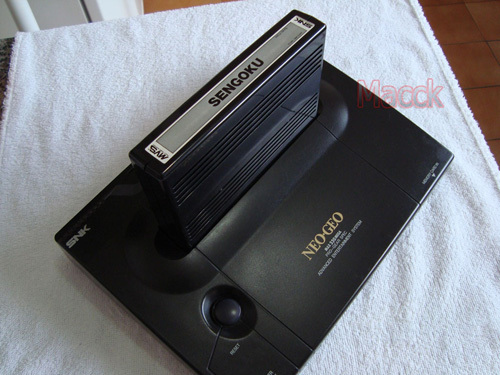 Front View with NeoCD Pad, ready to play. Consolized MVS built by Fraser in the UK. 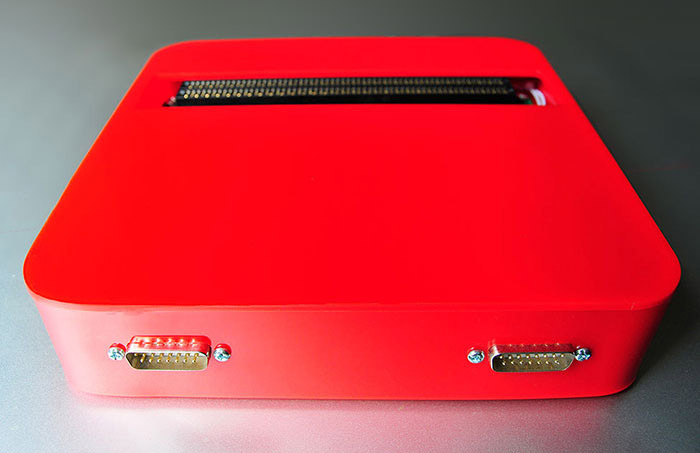 Red finish with black plexiglass. 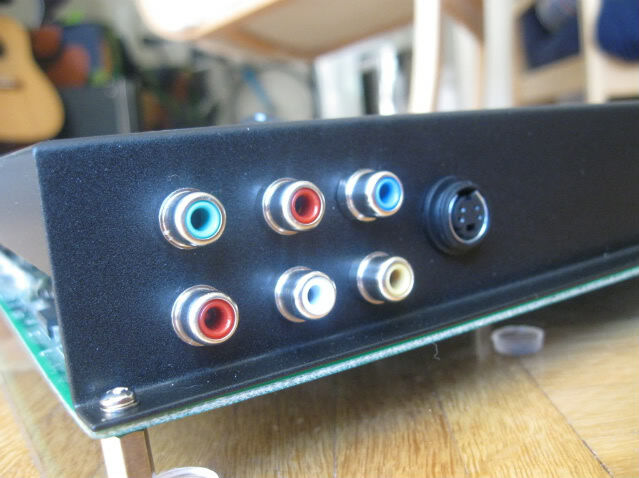 Rear shot with power jack, power button and RGB socket. 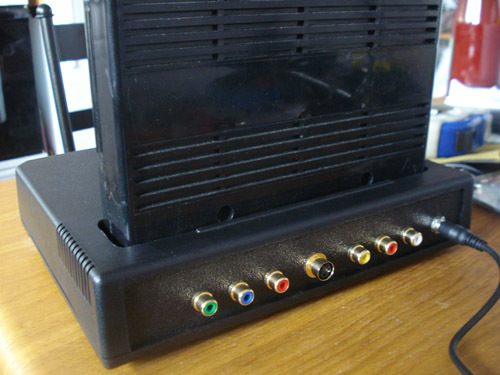 Custom RGB SCART cable with braided cable. 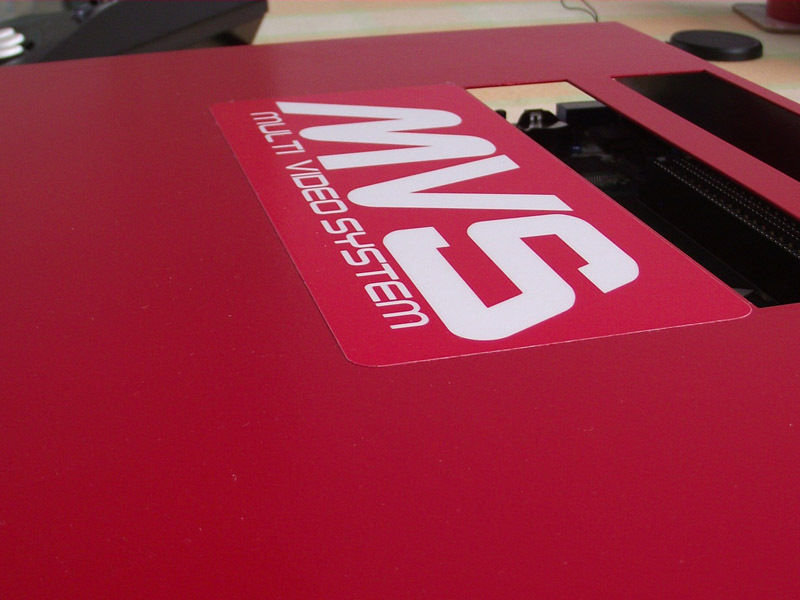 MVS decal to complete the look. 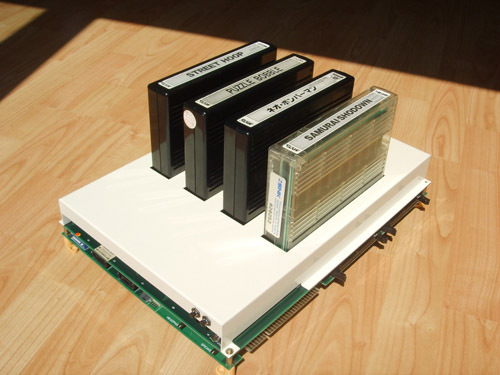 Consolized MVS built by Supergoose79. 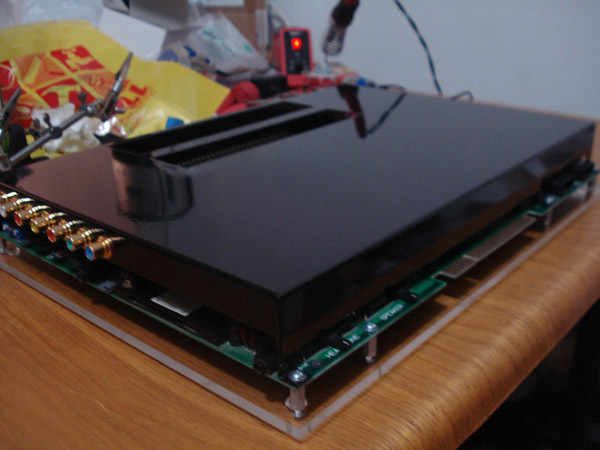 Has a very nice and sleek black cover for the PCB. 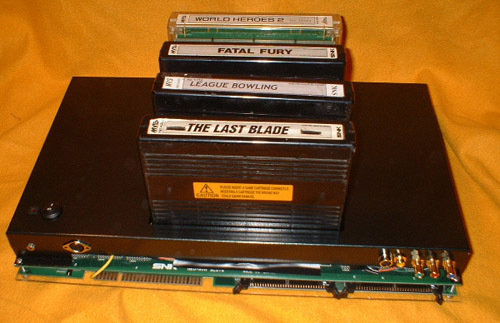 Shot without cart installed. Mirror like finish. With cart installed. Notice the shaved cart guides on the MV1-FZ. Consolized MVS built by Finch. Has a very professional and factory look to it. 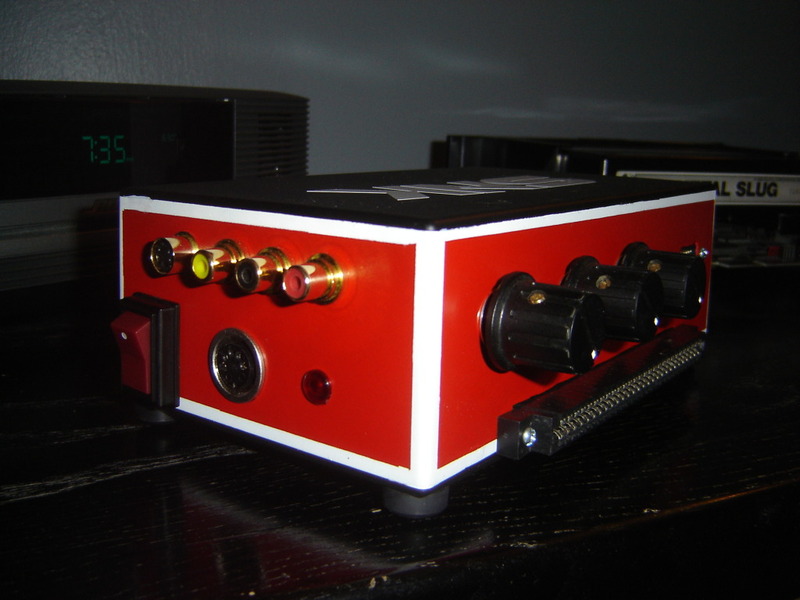 Powdercoated red using a Hammond extruded aluminum enclosure. 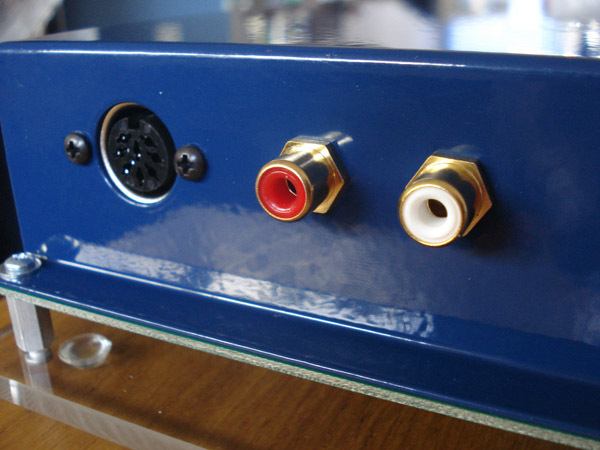 Rear shot of the video and audio jacks. 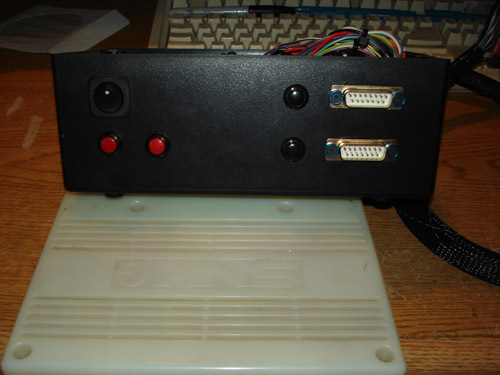 Includes an 8 pin DIN socket for RGB output. 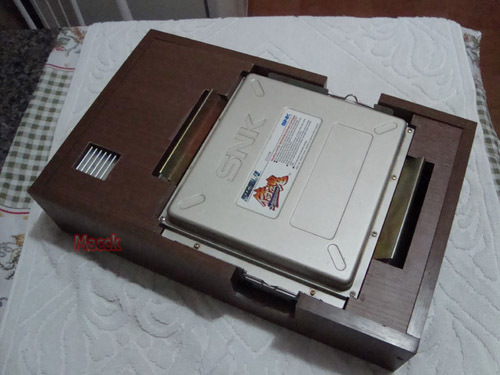 Cart slot. 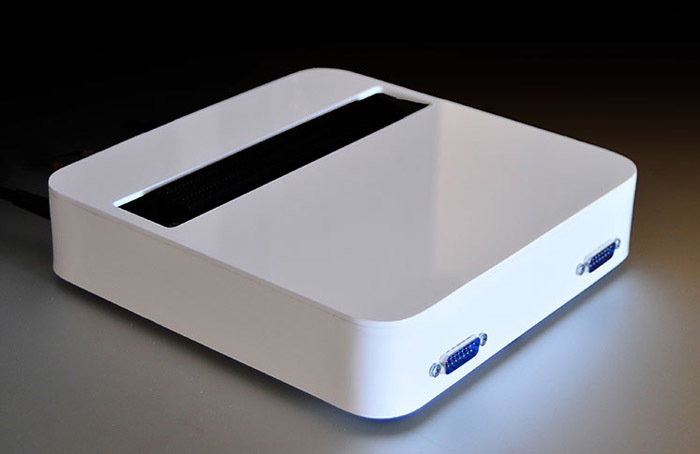 Notice the white dust shield. 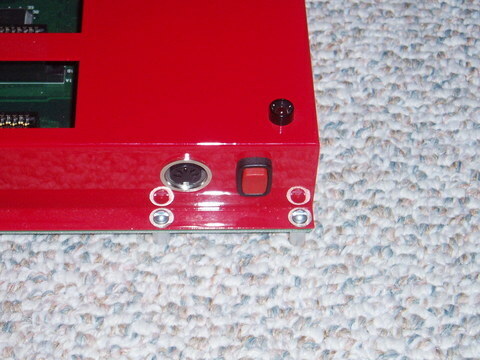 Side view showing vent and controller ports. 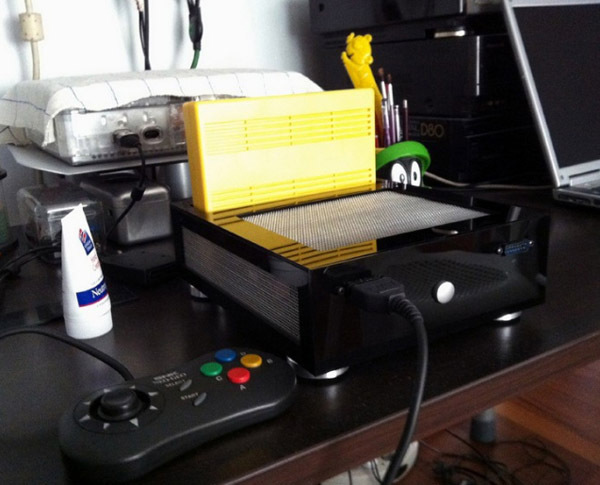 Consolized PGM owned by Logicdustbin, built by himself. 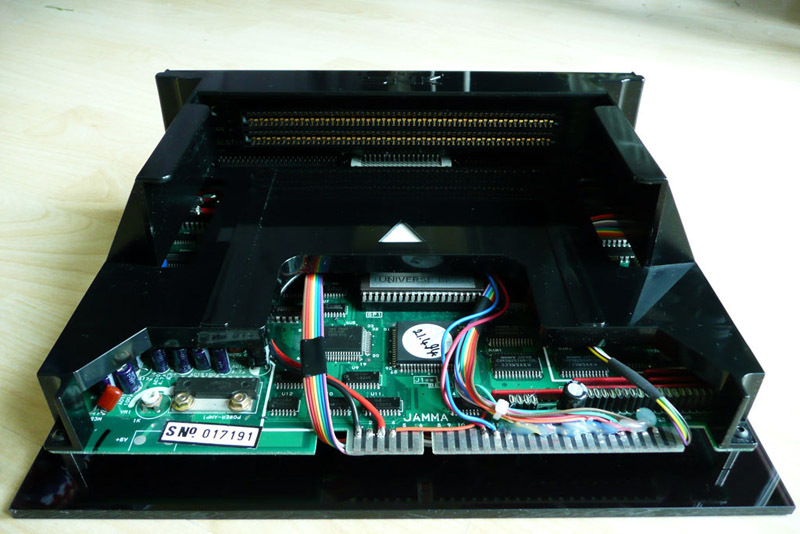 Has a very nice cover for the jamma edge connector. 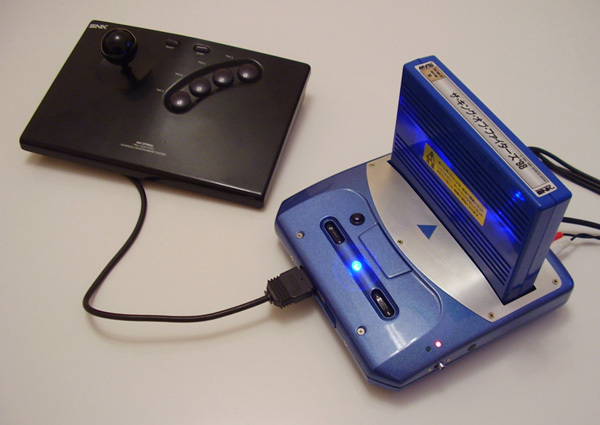 The most interesting thing about this consolized PGM is the fact that it supports 4 players. 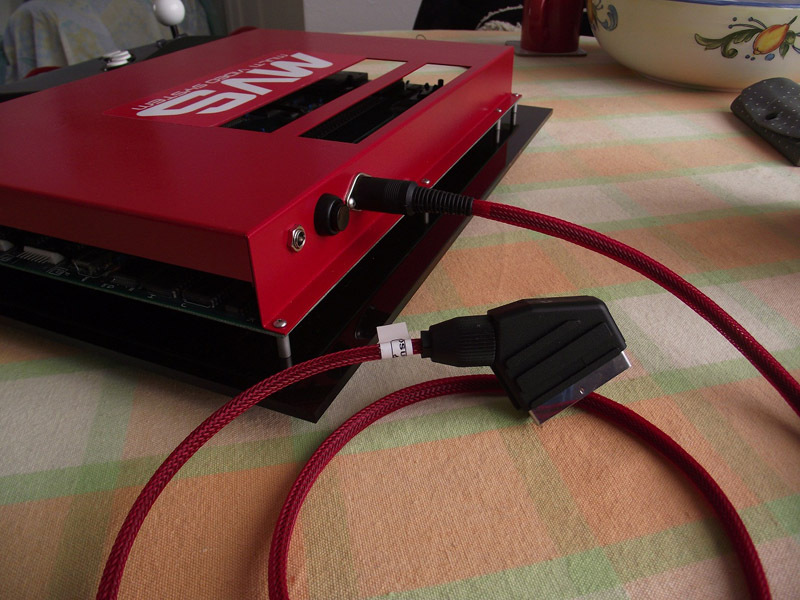 Supergun owned by Logicdustbin, built by himself. 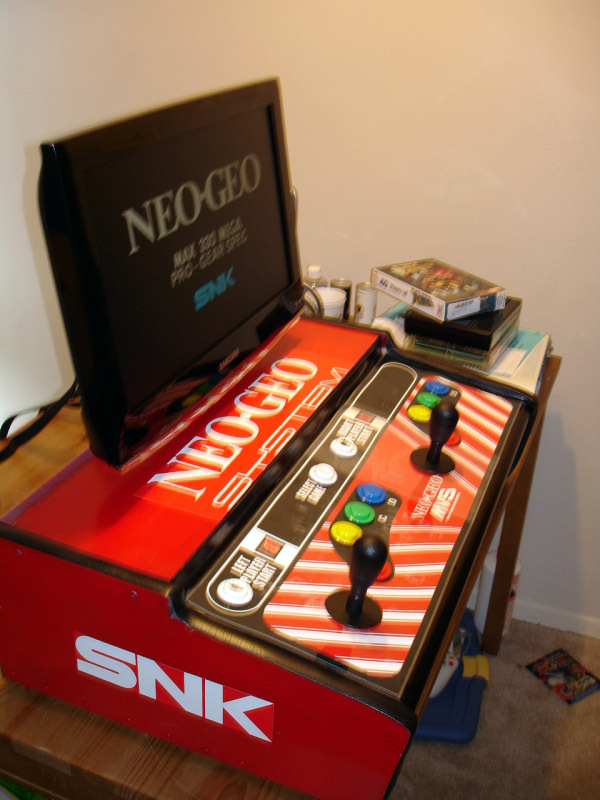 Includes Ault SC200 PSU and Custom SNES Jamma Pad. 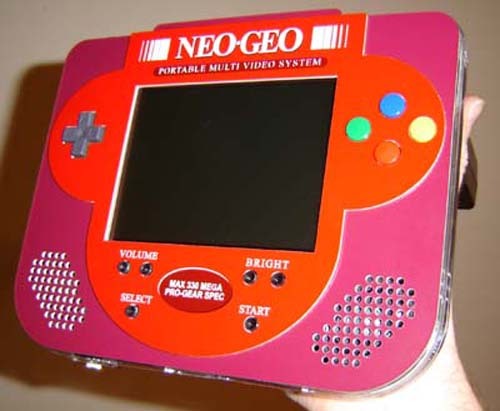 Built in obviously an NES game rental case. 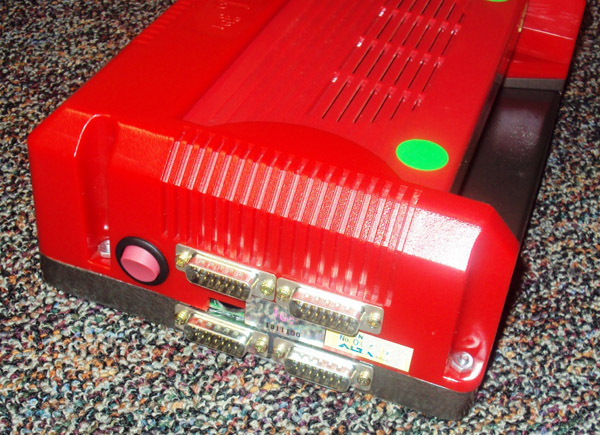 Here showing the DB15 controller ports. 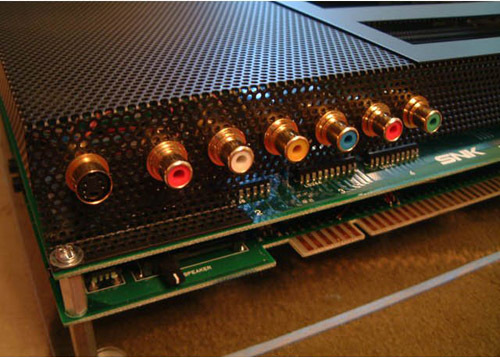 Audio and Video outputs. 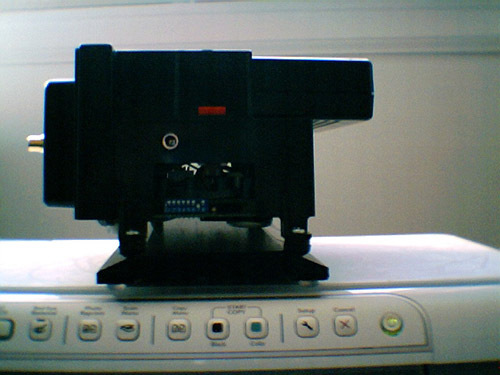 Video is handled by the WeiYan encoder inside. 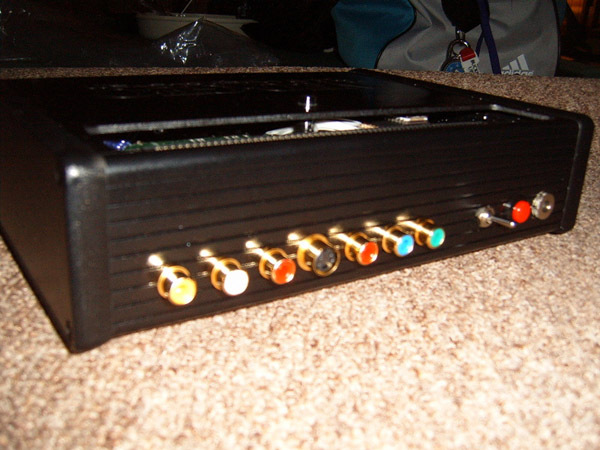 Rear of the Supergun showing the jamma connector. CMVS owned by chipperkwah, built by himself. 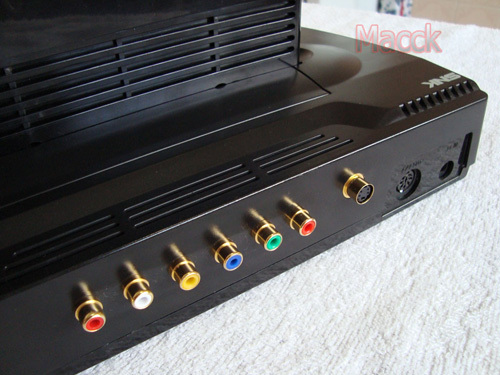 Component Video Only and stereo. 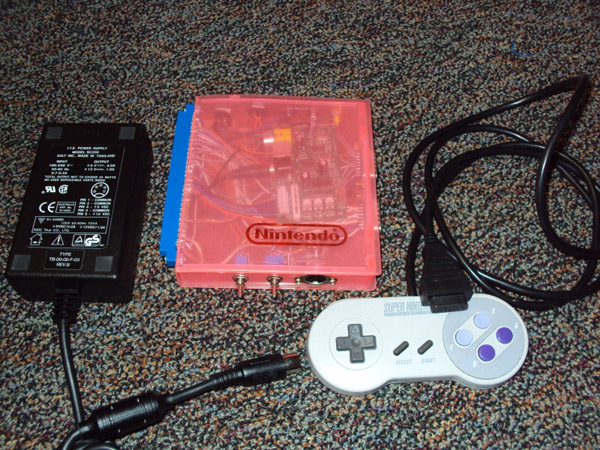 Power Jack and switch. Also noticed he used round aluminum standoffs instead of the common hex shape. CMVS owned by Zerminator, built by himself. 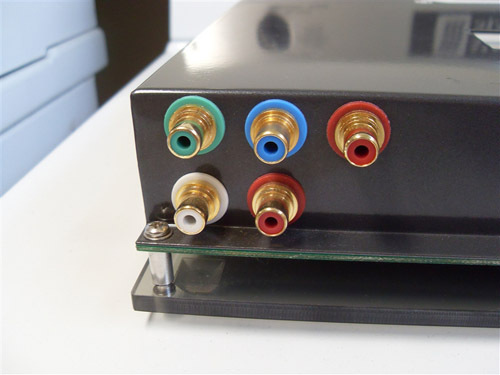 Component, S-video and Composite video jacks as well as stereo. Another angle of the CMVS. Standoffs look to be about 3/4 to 1" in height. 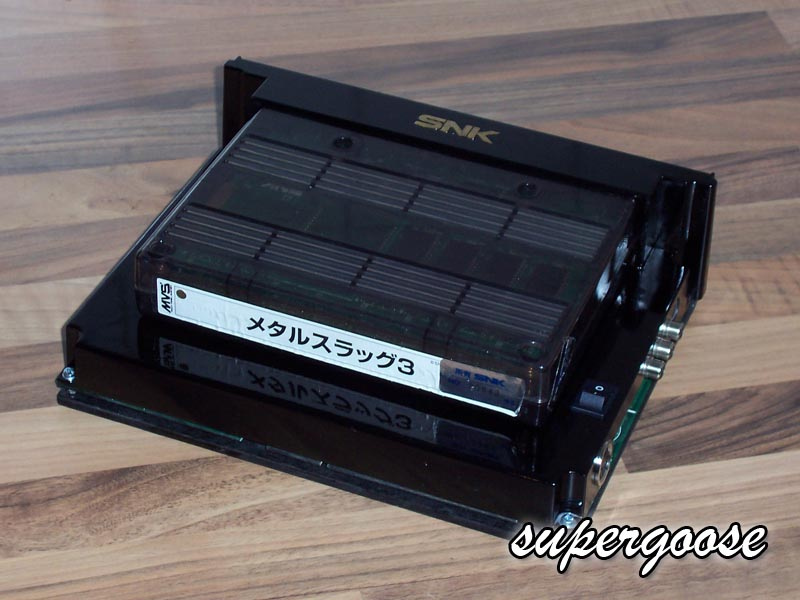 This is a Neo Geo themed Supergun made and designed by Werejag. This is a CMVS owned by Synbiosfan. 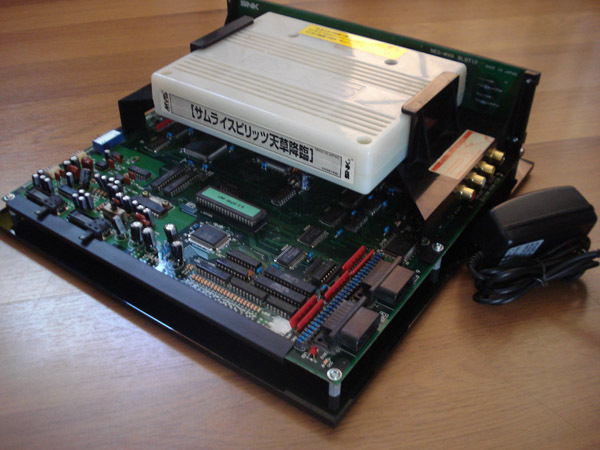 It uses an MV-1B MVS motherboard. Made by KPJ. 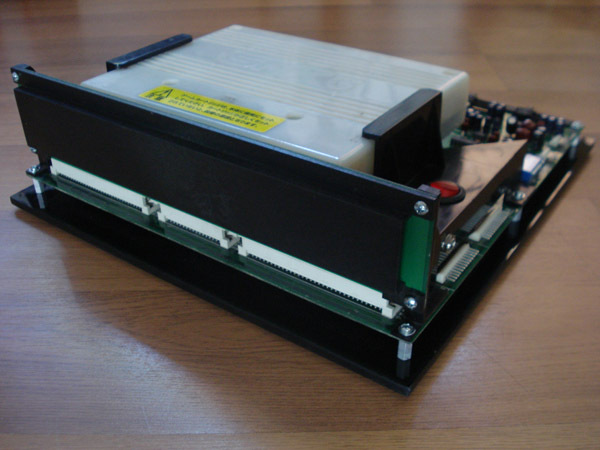 This is a Supergun owned by Cannonball, built and designed by Segasonicfan. 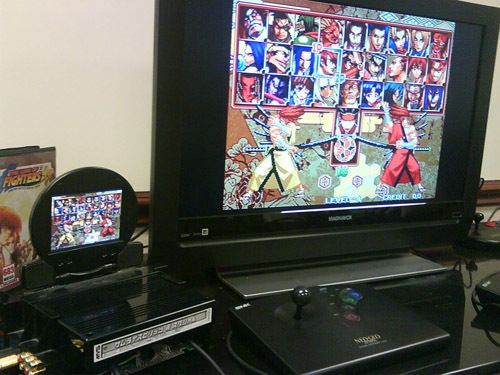 CMVS owned by Bibliophile, MV1-B with a PSOne screen for portability. Another view. 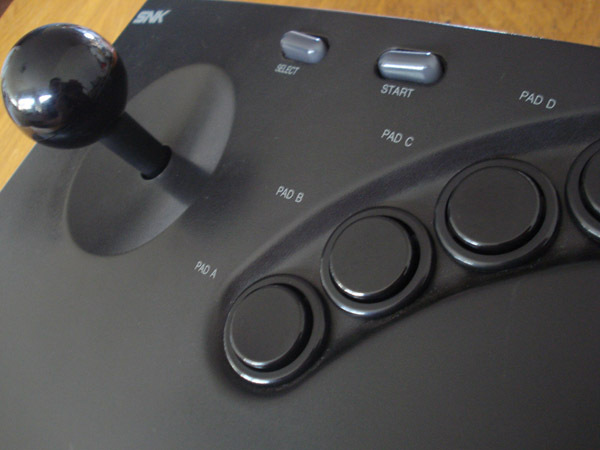 Also in picture, AES "Princess" stick. 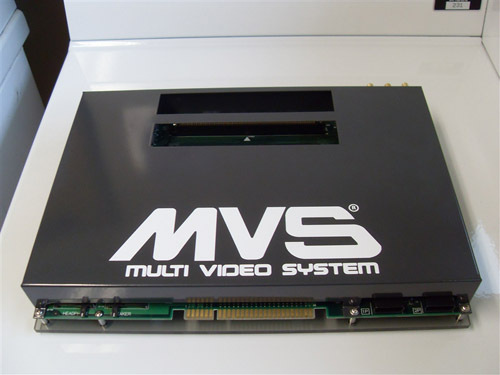 Portable MVS owned by Bibliophile. 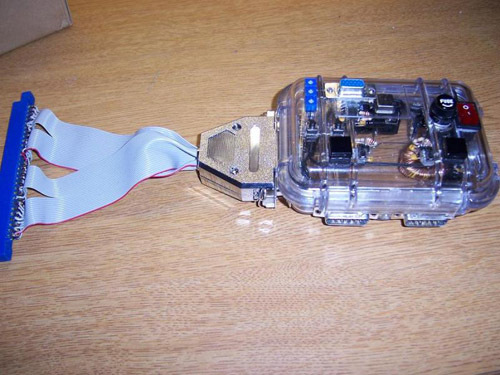 Created and designed by master modder Ben Heck. 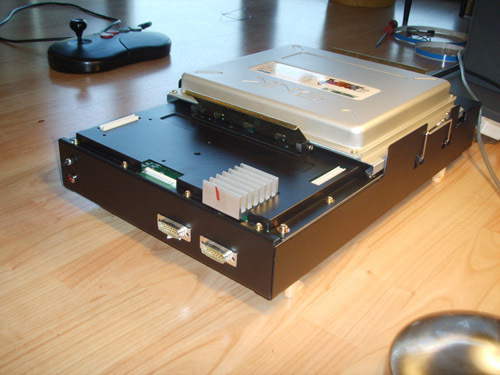 MV-1C housed in a Hammond aluminum enclosure. 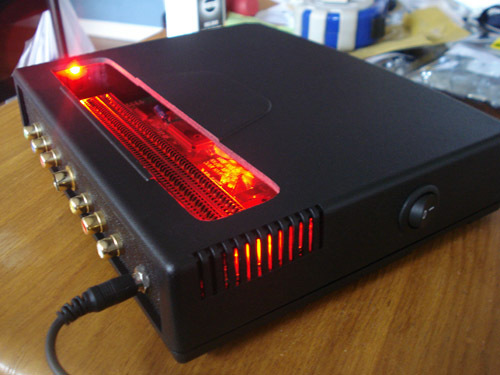 Designed and built by Loopyeddie. 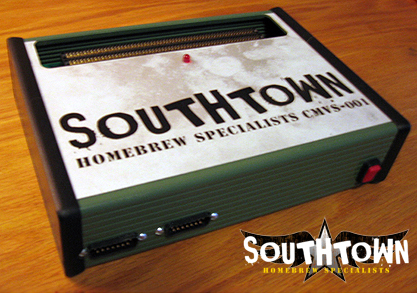 This CMVS was given away as a prize for the southtown-homebrew website launch. 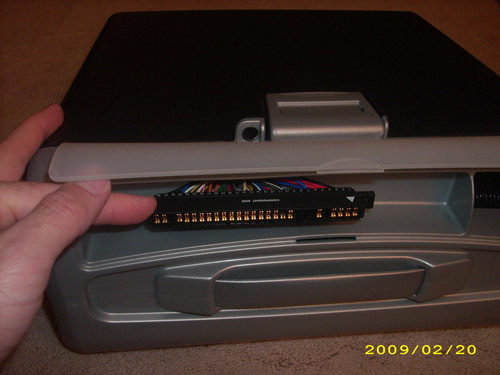 Anyone who purchased an insert was entered into the drawing as many times as the amount of inserts purchased. Originally won by Seawolf69 and later sold to Stellaking. A Prototype CMVS I thought of doing but never went into production, dubbed "Black Steel" based off a KPJ unit. 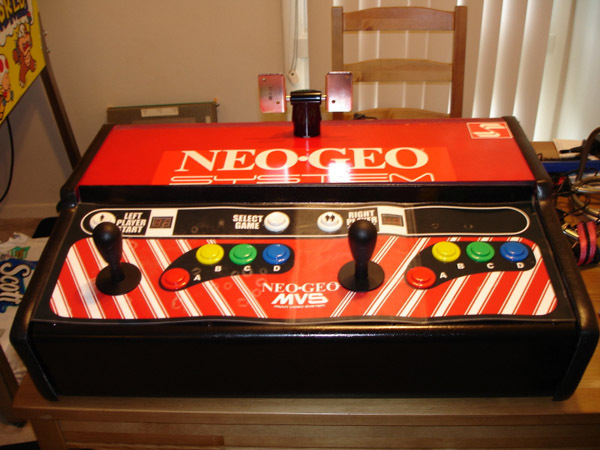 1 Slot built by Neo Si of Neo Star Systems, Neo Si is MIA. 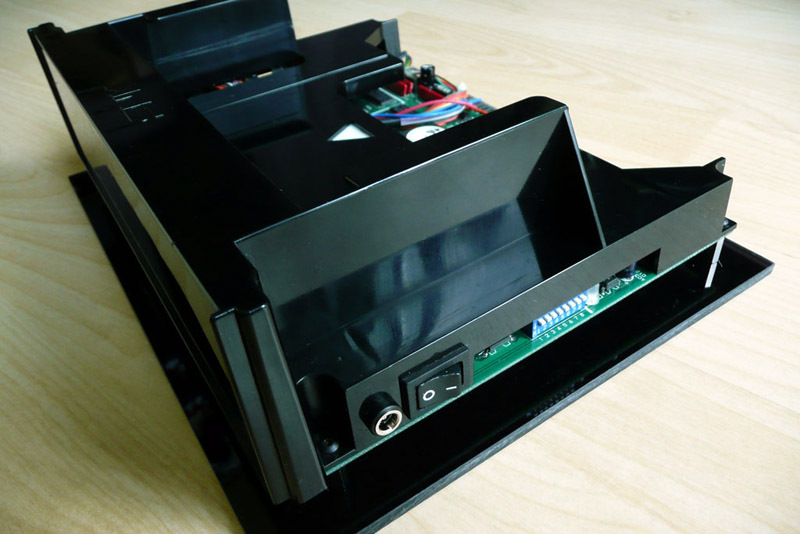 Enclosed 2 Slot by Neo Si. 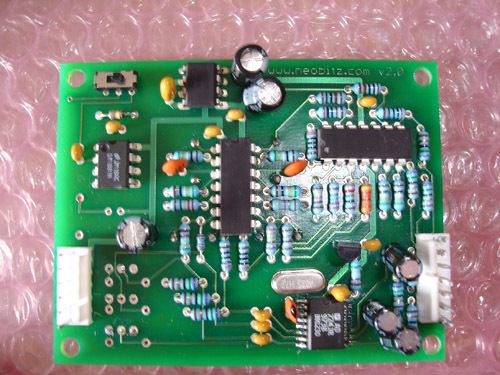 A 2 slot CMVS made by Loopyeddie. 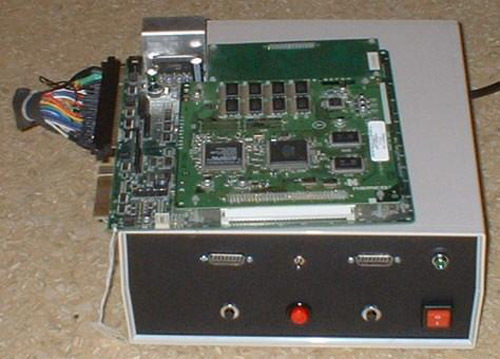 This was the first CMVS loopy built. 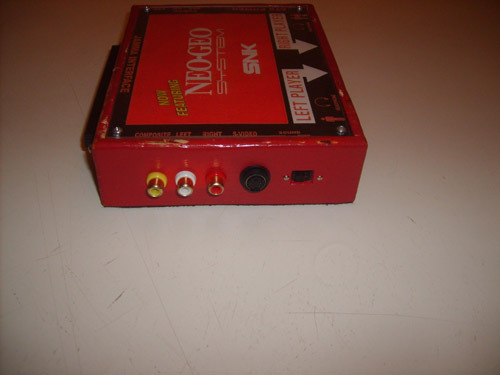 5 Pin din power jack and Power switch. 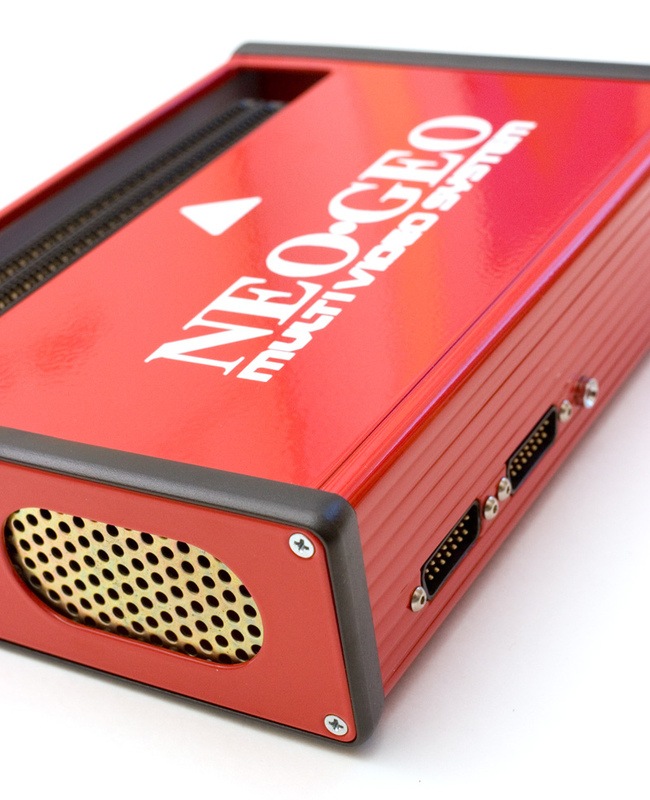 Supergun built by Neo Alec. 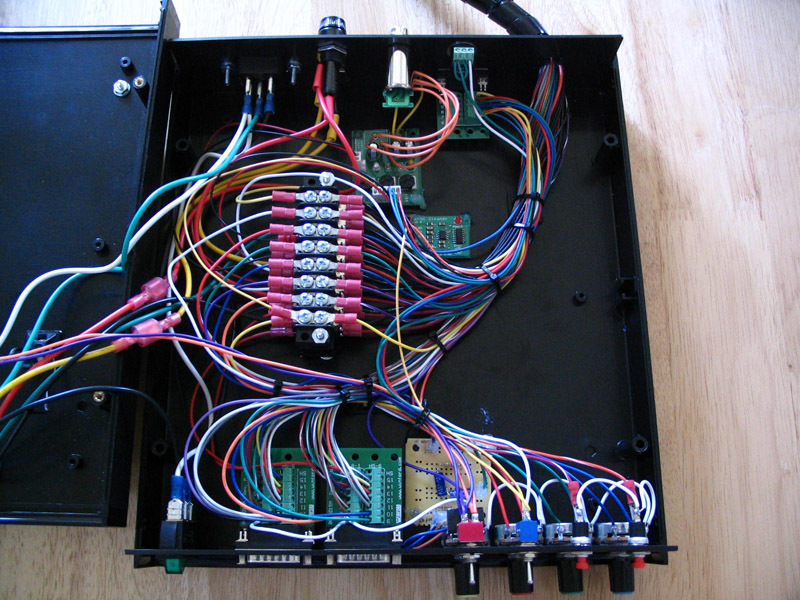 The truth about Supergun wiring, there's a lot of it. 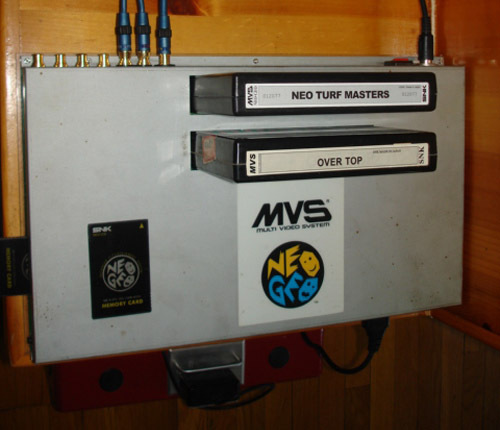 Consolized MVS in AES shell by Macck AKA Neo Killer. 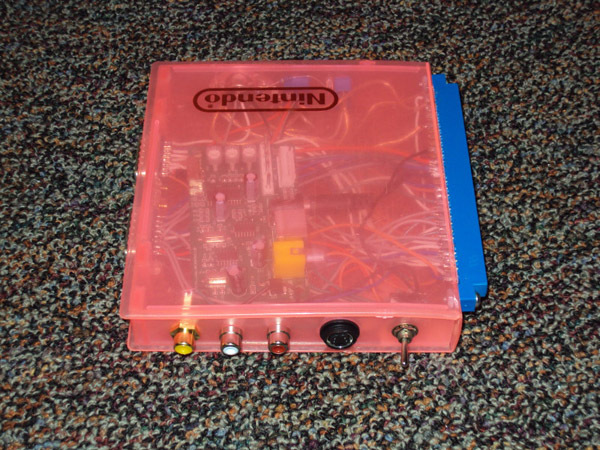 Supergun built by Retrogamer in a portable carry case. CMVS built by Loopyeddie and Jeff Kurtz. Rear of console. 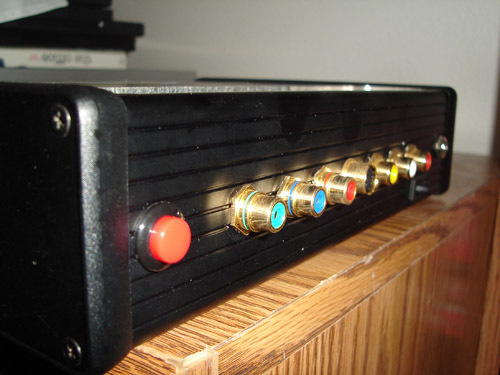 Component, S-video and Composite video jacks as well as stereo and Freeplay toggle switch. Odd couple. 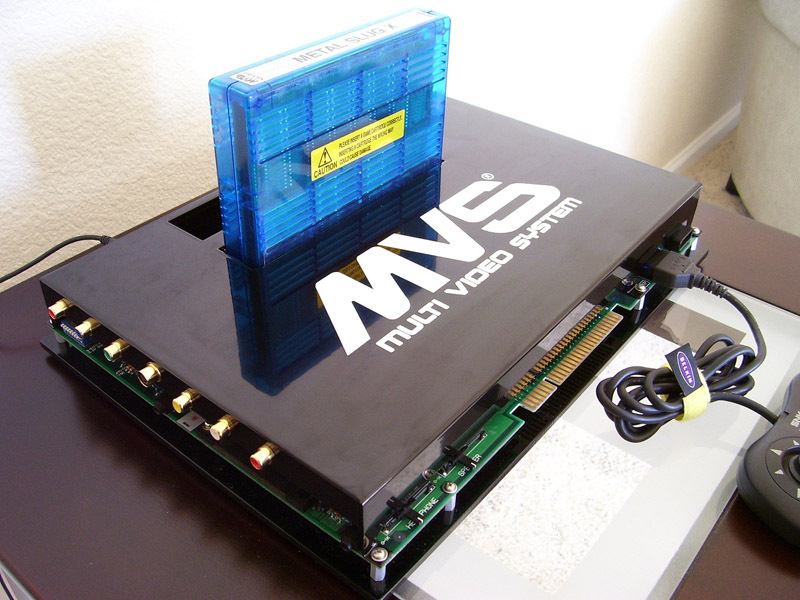 CMVS was built by Loopyeddie, JMKurtz and dubdubdub. 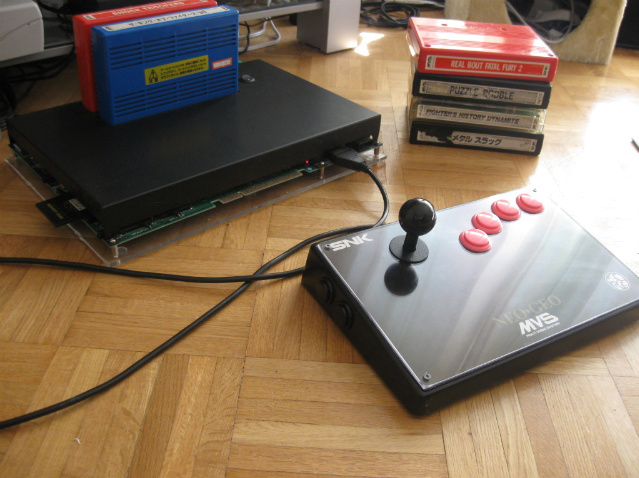 The AES Old style stick modded by dubdubdub with Sanwa stick and Seimitsu buttons. 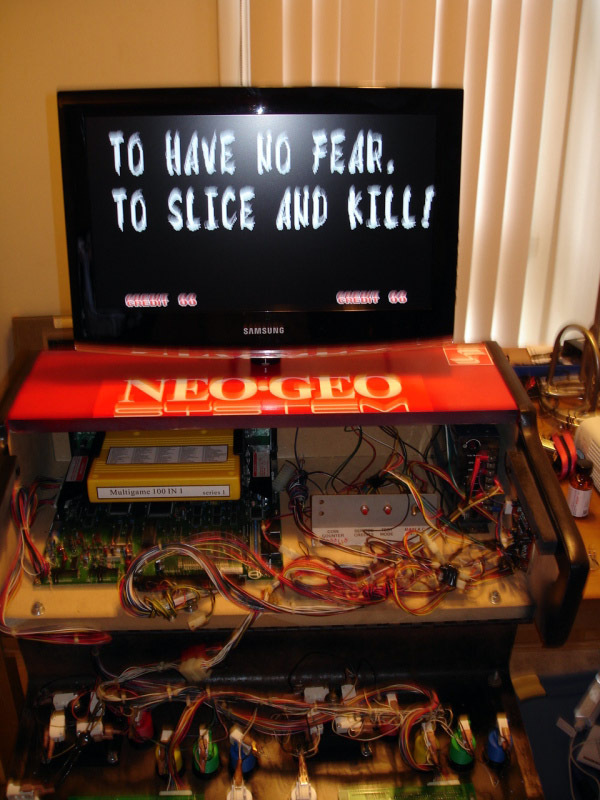 Inside shot of NeoGeeo's custom supergun. Rear of console. 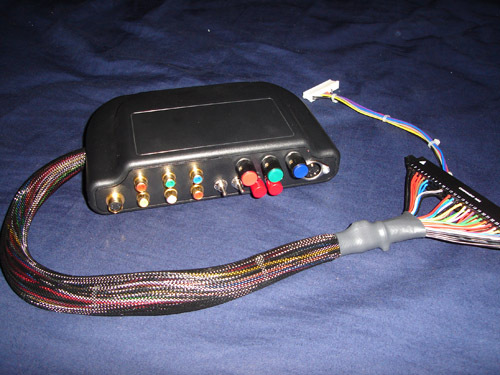 Component, S-video and Composite video jacks as well as stereo and a mesh tubed Jamma harness. 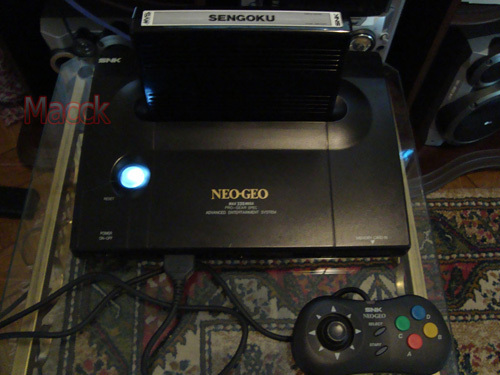 Side by side view of a black MV-2F and NeoGeoo's custom supergun. 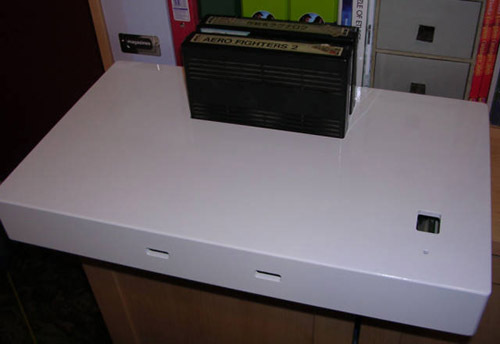 Rear of console. 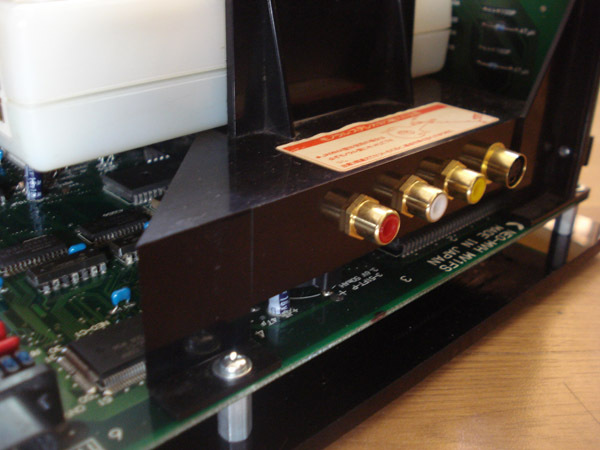 Component, S-video and Composite video jacks as well as stereo. 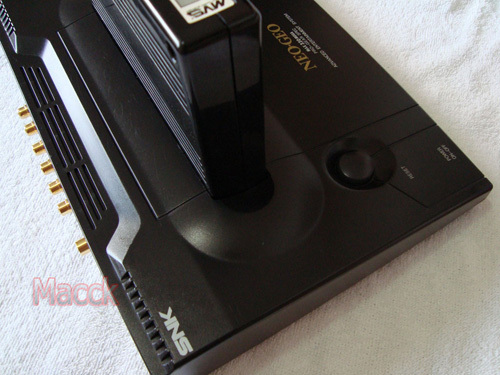 Supergun owned by kingbuzzo. 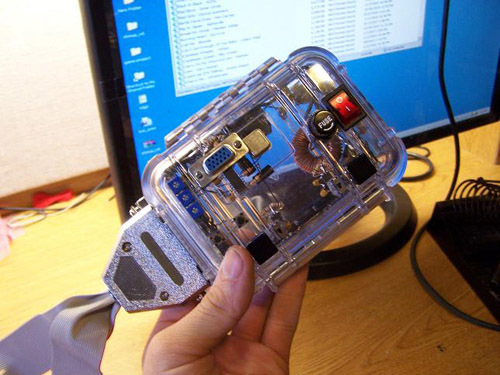 Looks to be a possible aluminum enclosure. CH64 owned and built by xmas. Rear of console. 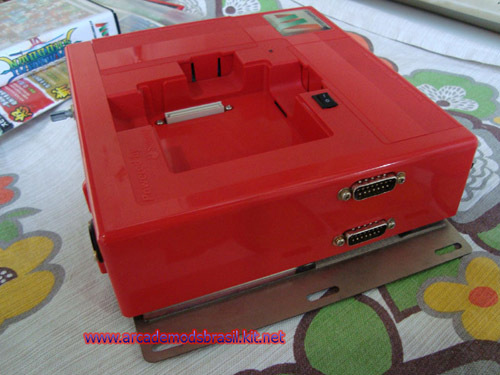 Power socket and switch as well as a SCART socket. CMVS by xmas. 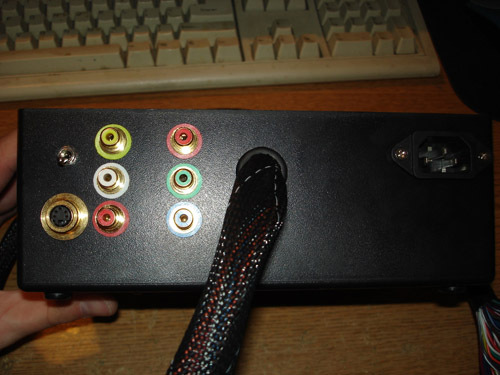 4 Slot with internal PSU, SCART output and RGB adjustment knobs. Other side of the CMVS. 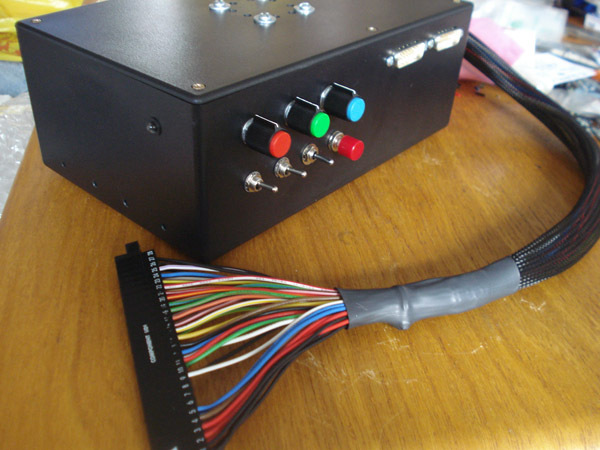 Interesting supergun designed and built by chipperkwah. 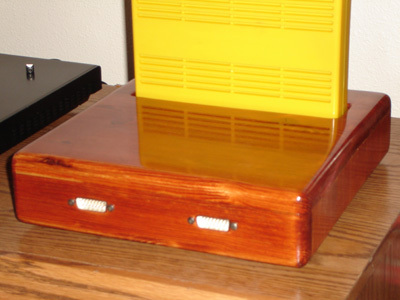 Consolized Hyper 64 by Macck enclosed in a faux wood enclosure. 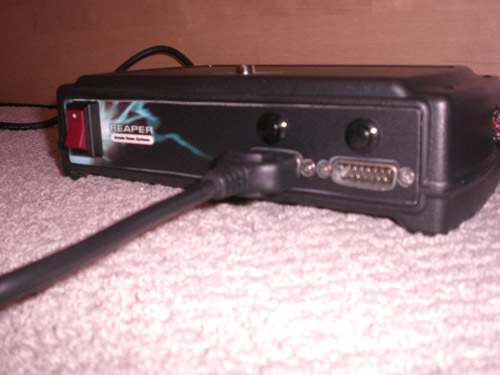 Back side of the Hyper 64. 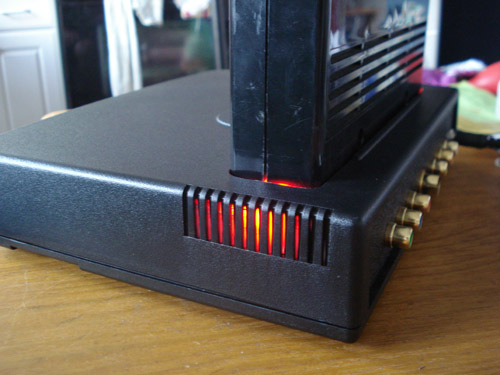 AV jacks have individual resessed ports. 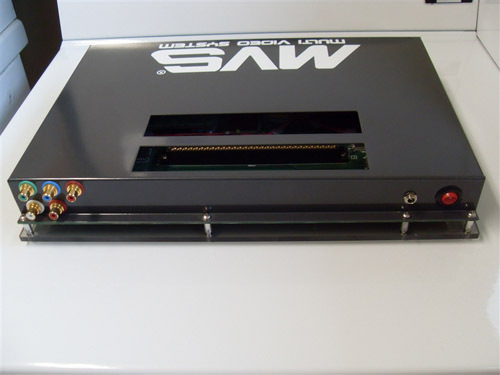 Macck's first AES CMVS with relocated cart slot. 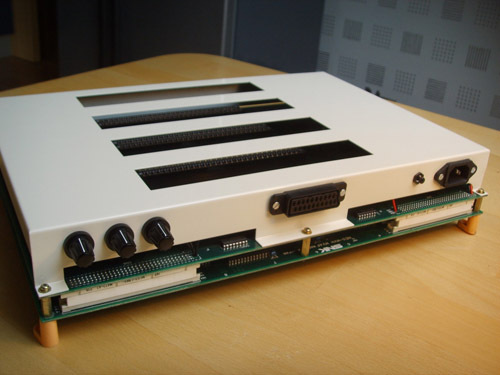 Interesting supergun designed and built by Norton9478. 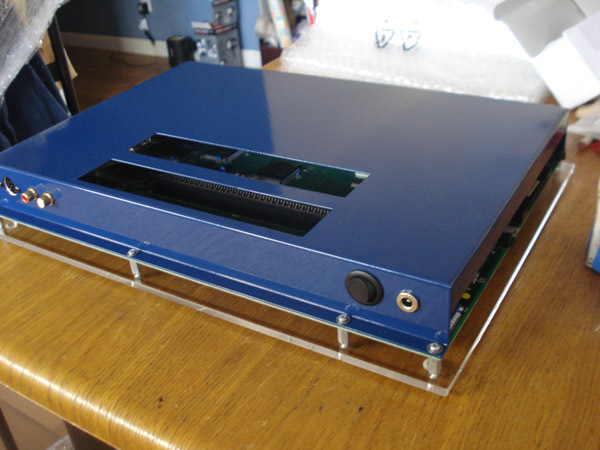 Another interesting supergun designed and built by Norton9478. Notice the cable ends being put to good use. 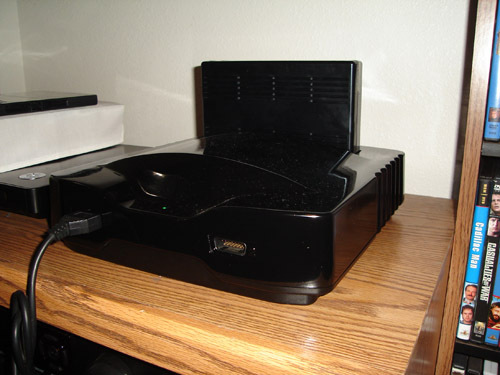 CMVS in a Sega Saturn shell by Norton9478. 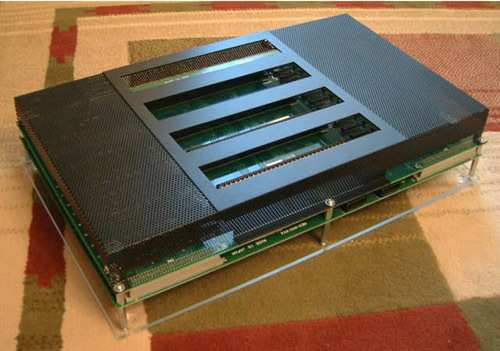 4 Slot CMVS by Norton9478. 2 Slot CMVS built by electricgrave. 4 Slot CMVS built by kpj and repaired by electricgrave. 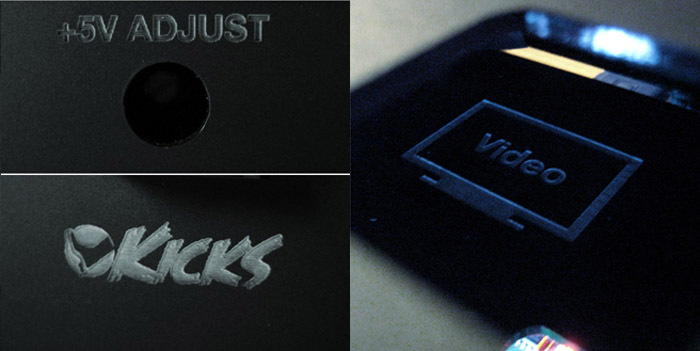 Video and Audio Jacks on 4 slot CMVS. 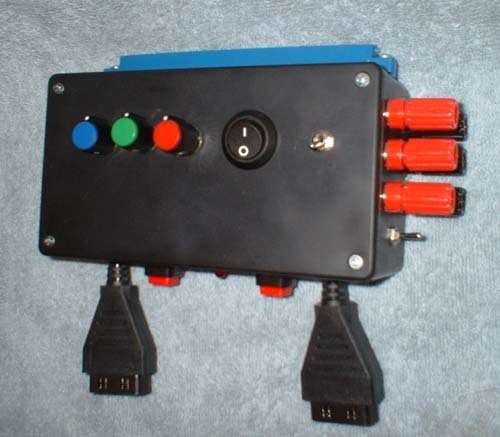 Power jack and switch on 4 slot CMVS. CMVS built by 300wins. 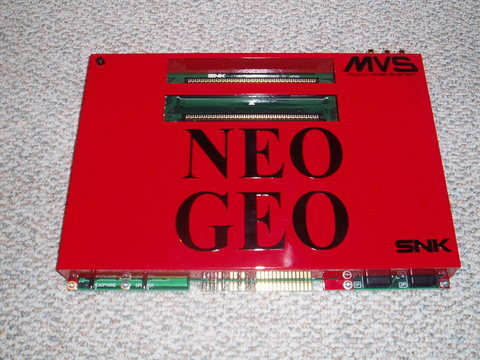 MV-1C in a Genesis 2 shell. 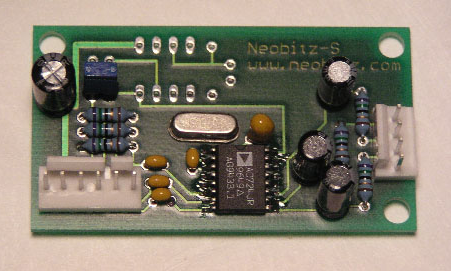 Unit has a Neobitz encoder, Unibios, RGB socket and other features. Currently owned by Ultra Douche and Kan stalker, MeTaLCzAr. 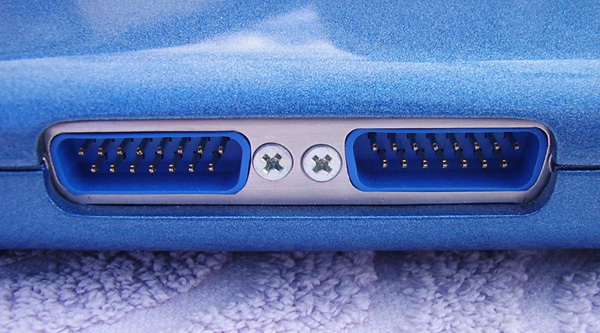 DB15 Controller Ports, blue ones, ya. 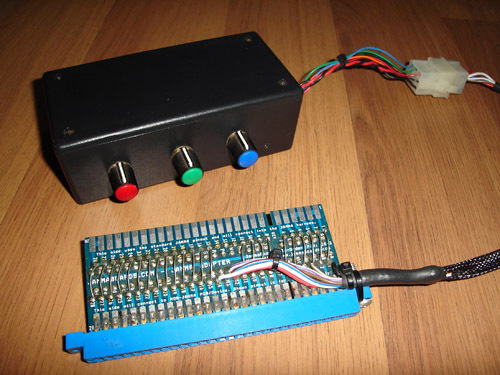 Power switch for Neobitz encoder. 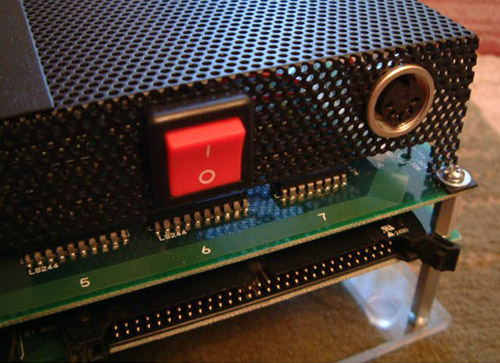 Since the unit has an RGB out socket this switch is to increase RGB signal strength by turning off the encoder. 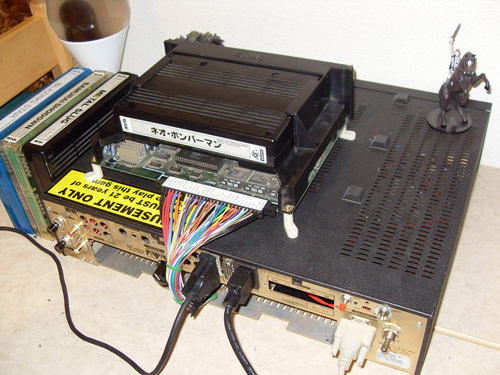 Supergun built by SamuraiShodownSensei. 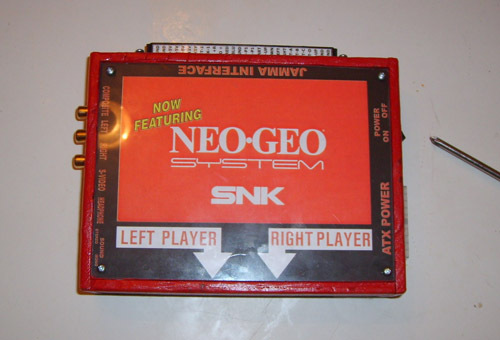 A Supergun built into a Neo Geo control panel for the hidden look. 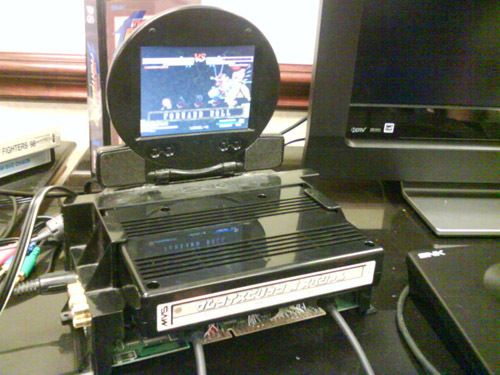 Supergun with mounted LCD screen. 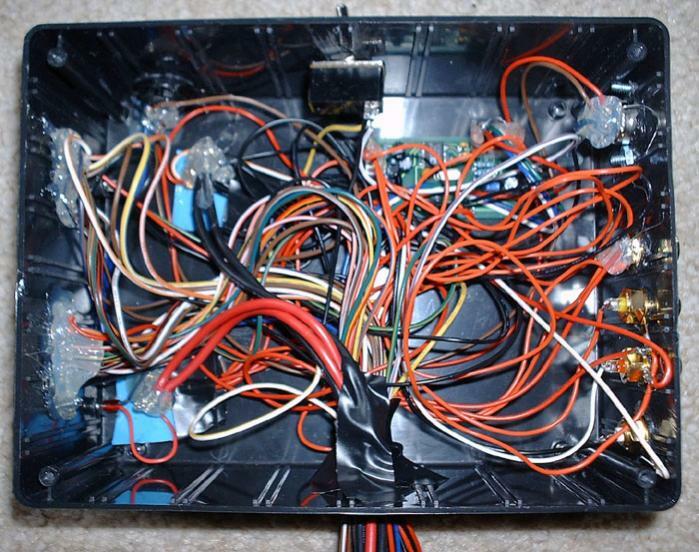 Control panel flipped open exposing MV-1F, PSU and wiring. 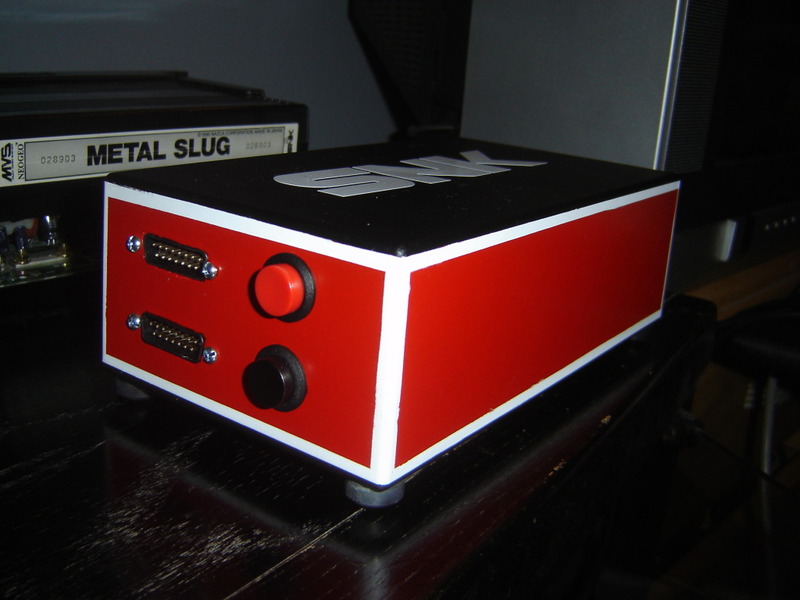 Supergun built by pixeljunkie. 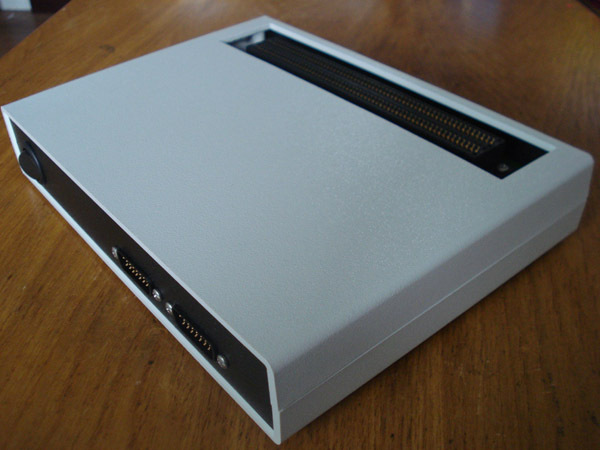 A Supergun with that commercial built look. 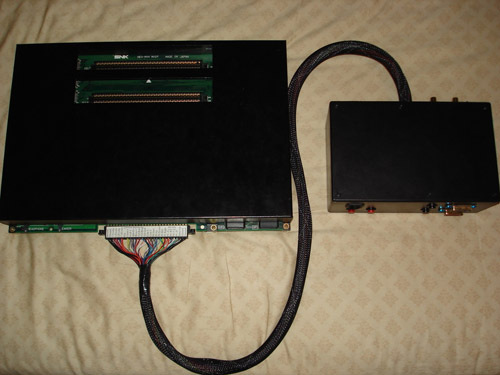 Jamma harness with sub harness. If you have a photo you would like to submit, click here to send us an E-mail. Don't forget to give us a little info about your submission. Please try to submit at least 4 photos of your project if possible.